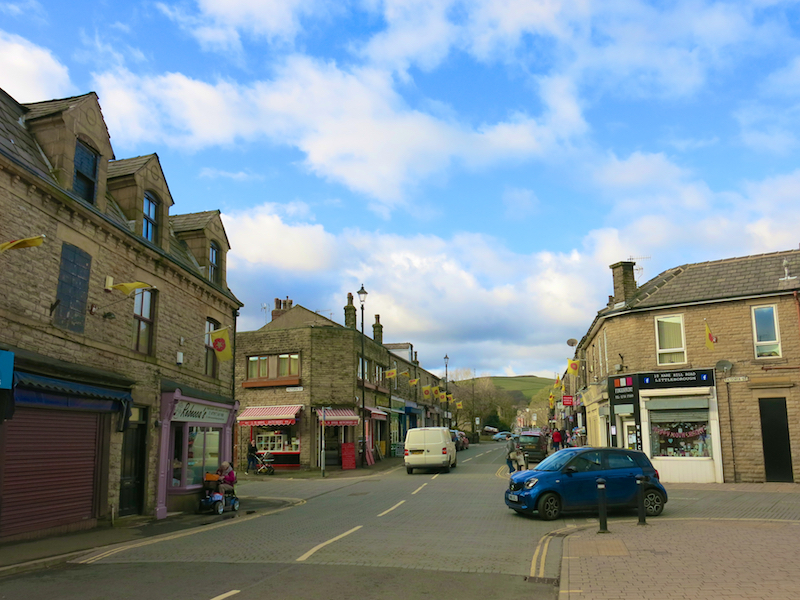 Littleborough is a characterful small town developed tin the 17th and 18th centuries during the industrial revolution. 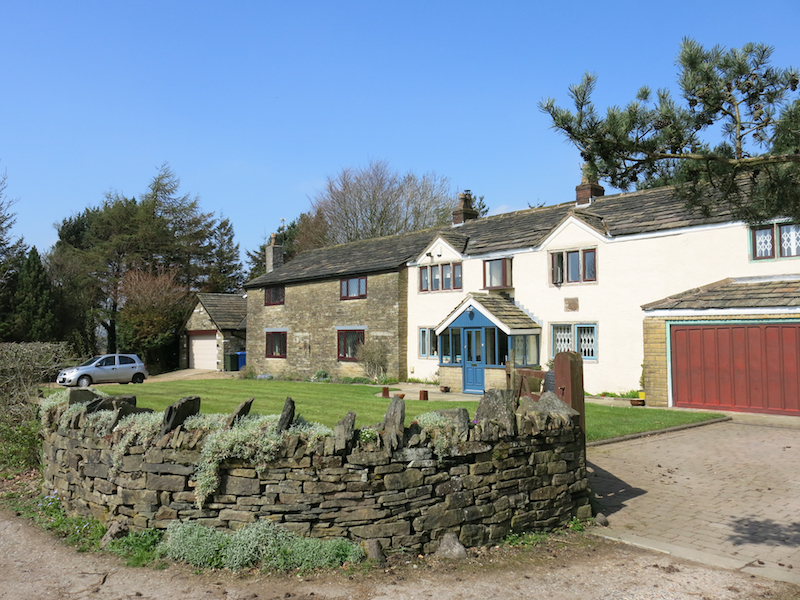 The traditional building style and local stone have created a Pennine charm with wild Pennine surroundings. 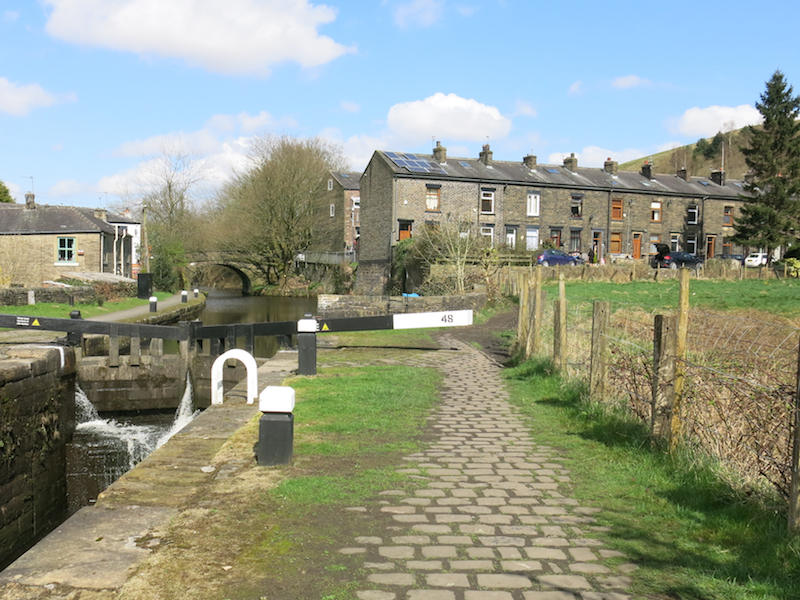 The town grew steadily throughout the 19th Century as a result of the construction of the Rochdale Canal between 1775 and 1805, and the opening of the Summit Railway Tunnel in 1841. 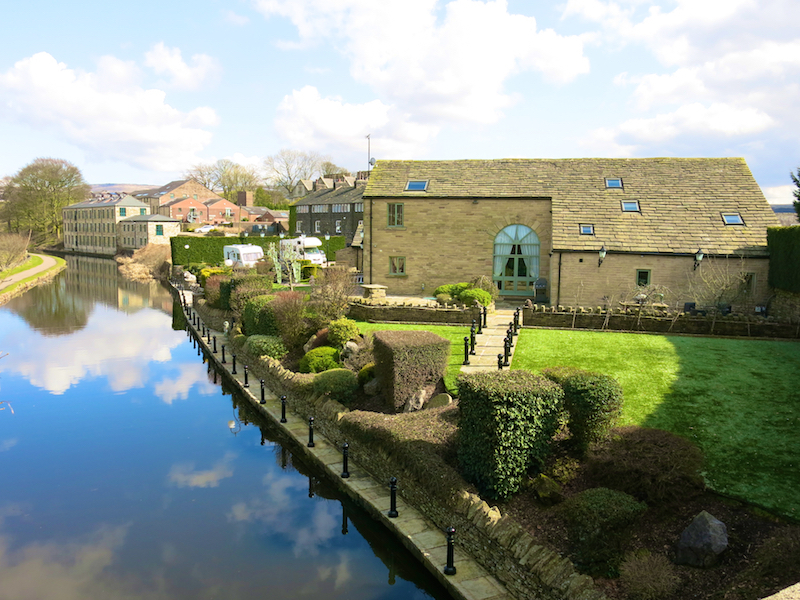 Its strategic position at the junction of two major cross-Pennine routes is reflected in the Grade II listed Toll House, Coach House and 19th century viaduct by George Stephenson, all reflecting the importance of road and rail transport. 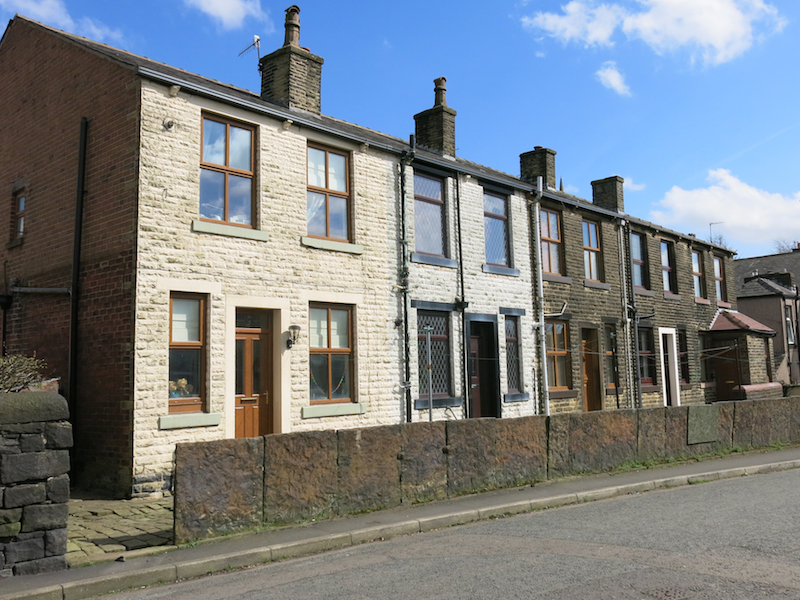 Unusually for a Lancashire town, Littleborough had both a woollen and a cotton industry as evidenced in the weavers’ and workers’ cottages, many now converted to attractive town centre shops. 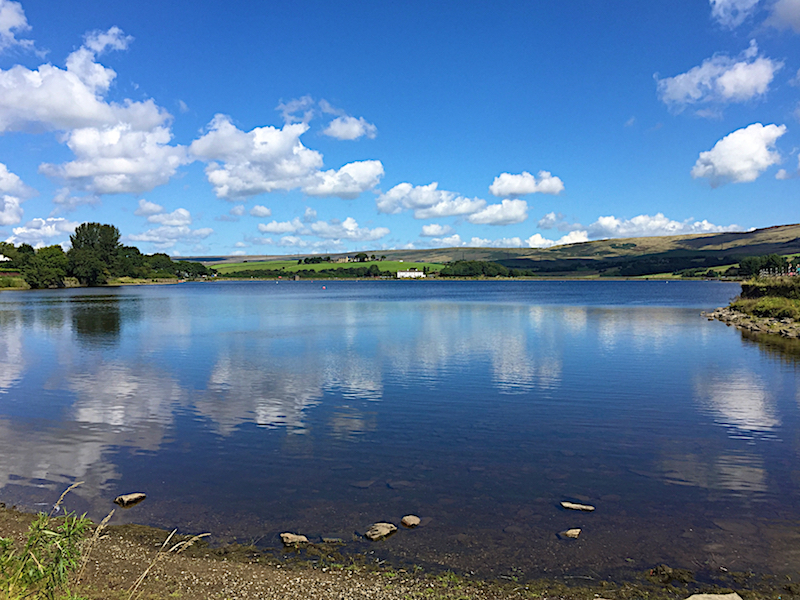 This walk begins at the Hollingworth Lake Visitor Centre, where there is ample pay and display car parking, a cafe, an information centre and toilets. 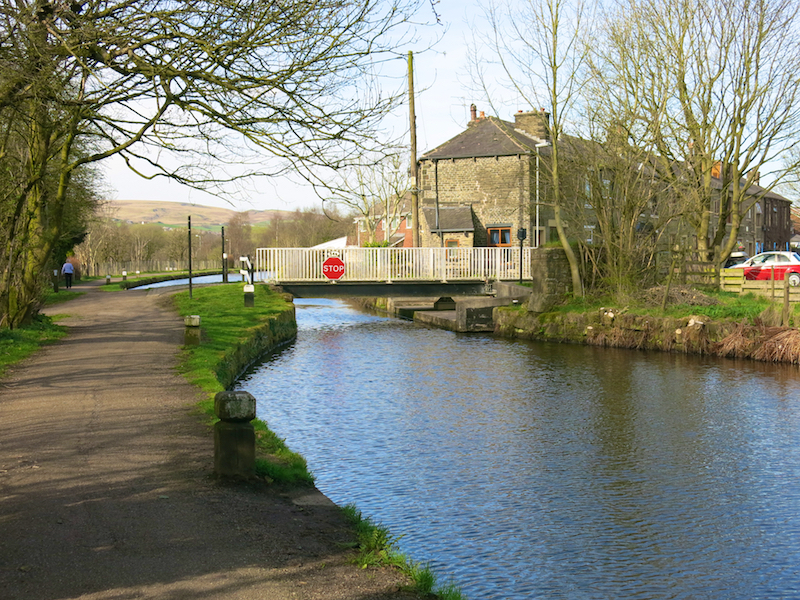 There are alternative possible starting points on this “circular” walk at Littleborough and Smith Bridge Railway Stations, both of which are very close to the route. 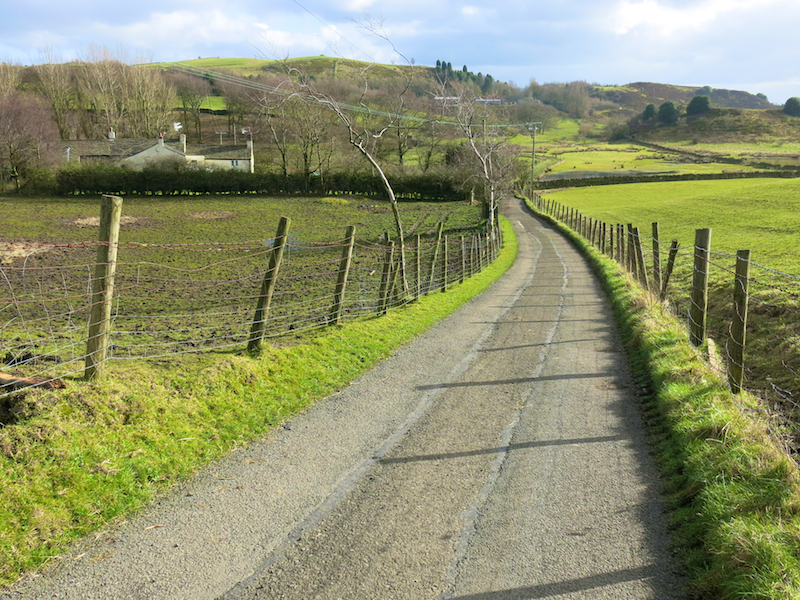 The walk is mostly flat on paved or gravel paths. 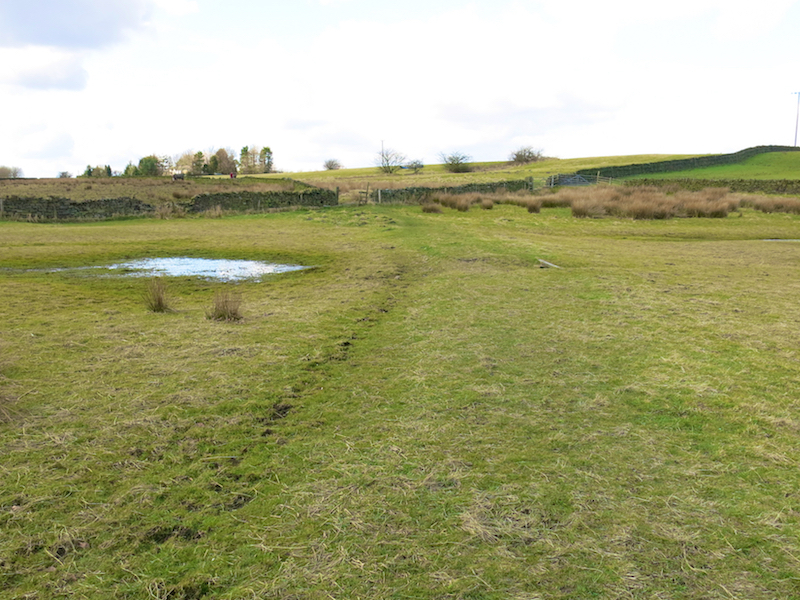 There are a few stretches across fields, which can be wet after rain or snow. 1. 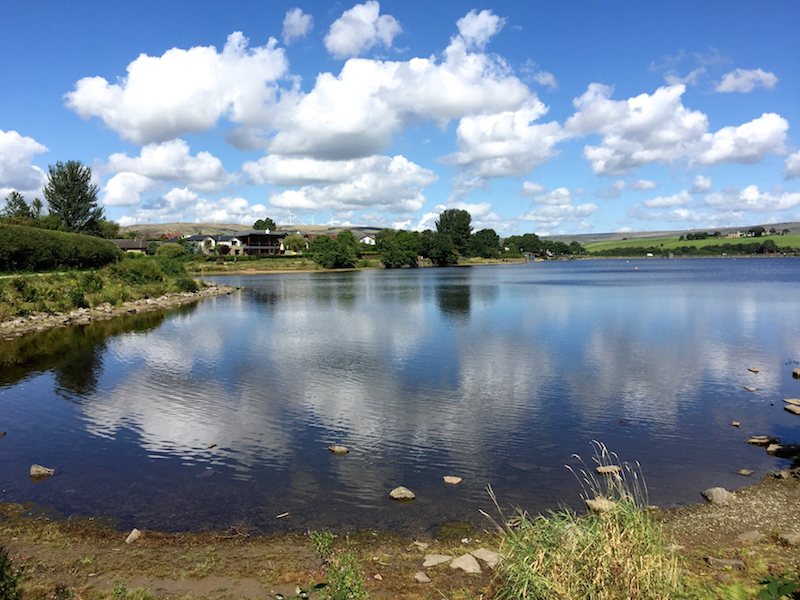 Leave the Visitor Centre car park and walk up the road to Hollingworth Lake. Turn left at the lake and walk along the lakeside path, on a dam. At the end of the dam continue along the road with the lake on the right. 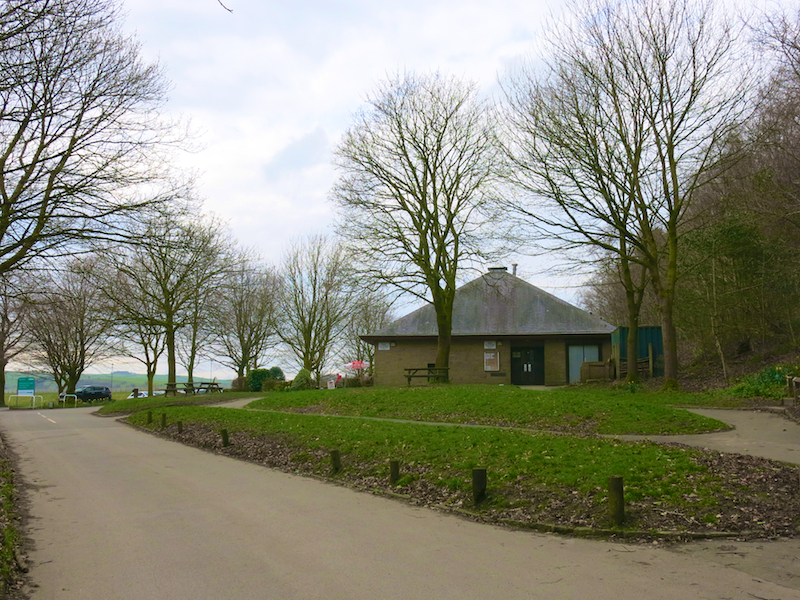 Soon after the lake ends, by a nature reserve, turn right at a sign to the Pavilion Cafe, cross a bridge, pass a play area and continue along the lake shore to the Cafe. 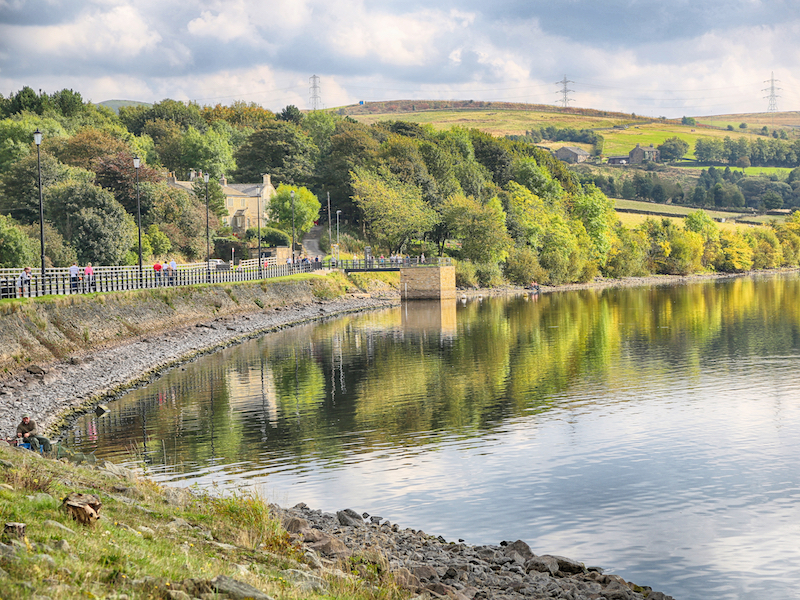 Hollingworth Lake is a 130-acre (53 ha) reservoir, originally built as the main water source for the Rochdale Canal. It developed as a tourist resort from the 1860s, and became known as the Weighver’s Seaport. Hotels were built around it, at least two of which had outdoor dancing stages with gas lighting. Tourism was helped by the arrival of the railway in 1839, which brought day-trippers and weekend visitors. 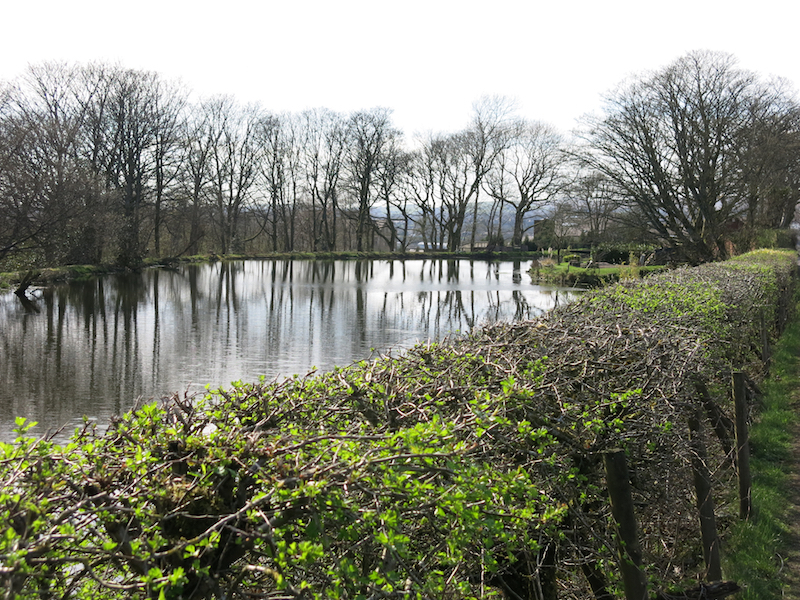 Fishing developed after 30,000 fish, mostly bream, dace and perch were introduced in 1863.The canal company sold the reservoir, with seven others, to the Oldham and Rochdale Corporations for water supply in 1923, by which time the canal was in terminal decline. 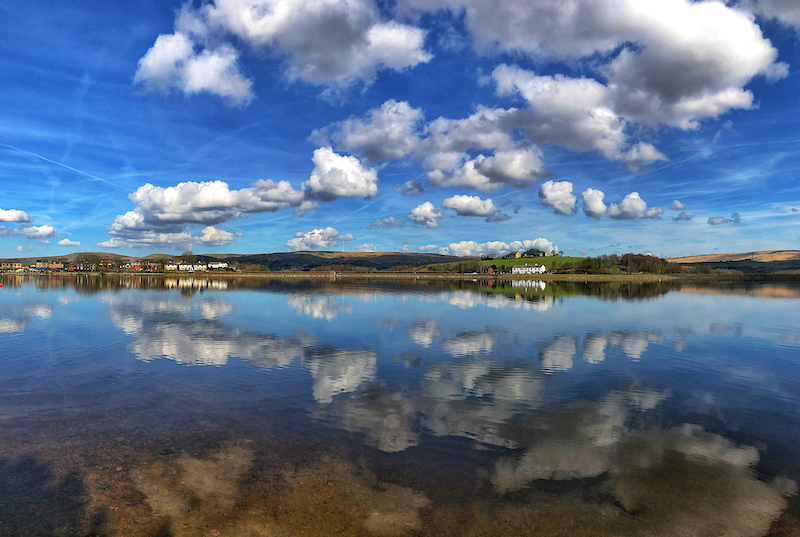 Rochdale Council developed the area into the Hollingworth Lake Country Park in 1974. There has been a steady increase in facilities since, and it is now a thriving centre for watersports and other activities. 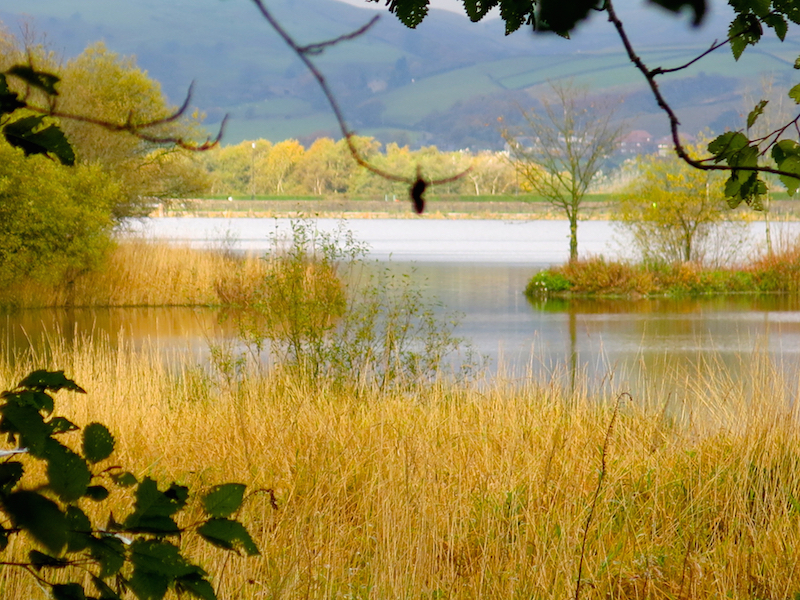 The lake provides habitat for a variety of wildlife and is used for fishing. The variety of fish has been expanded by stocking the lake with carp, tench and roach, in addition to the species introduced in 1863. 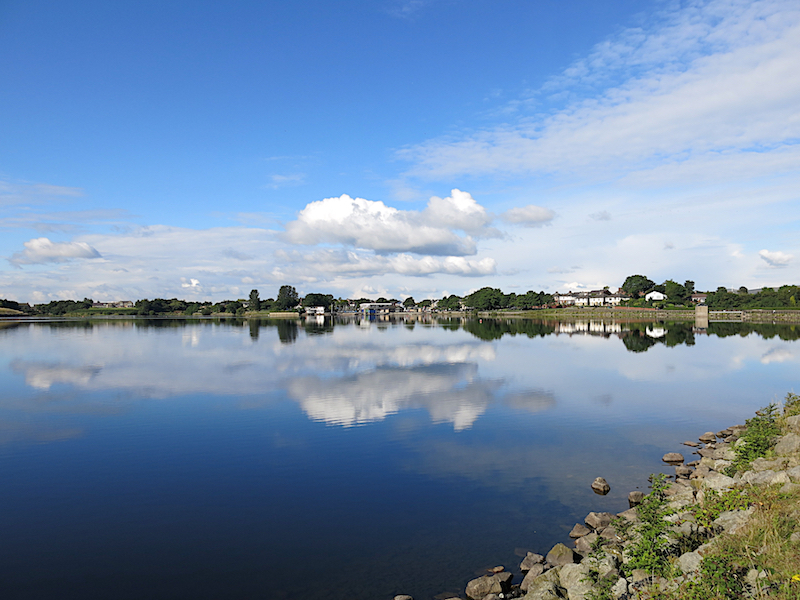 The lake was used for training by Captain Matthew Webb before he became the first man to swim the English Channel in 1875, and was used for the “World Professional Mile Championship”, a long-distance swimming event, in the 1880s. 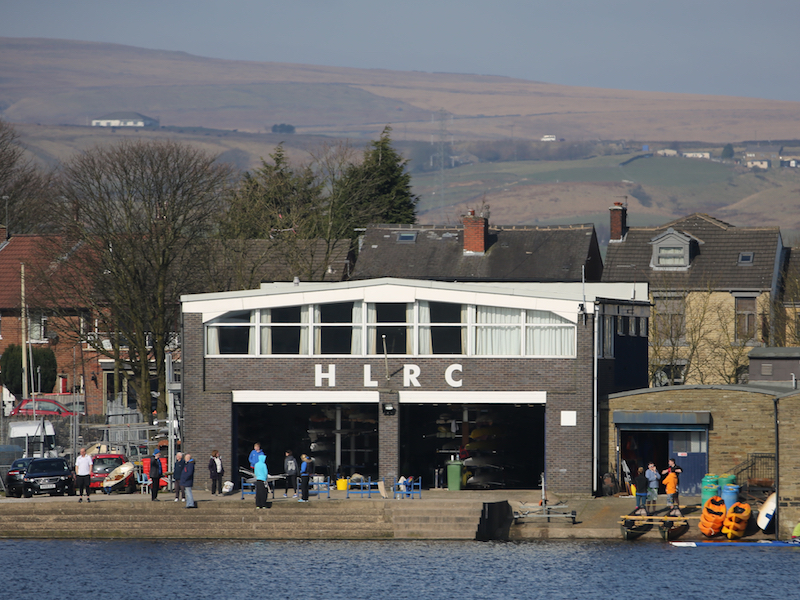 It is home to the Hollingworth Lake Rowing Club, which has been in continuous existence since 1872. 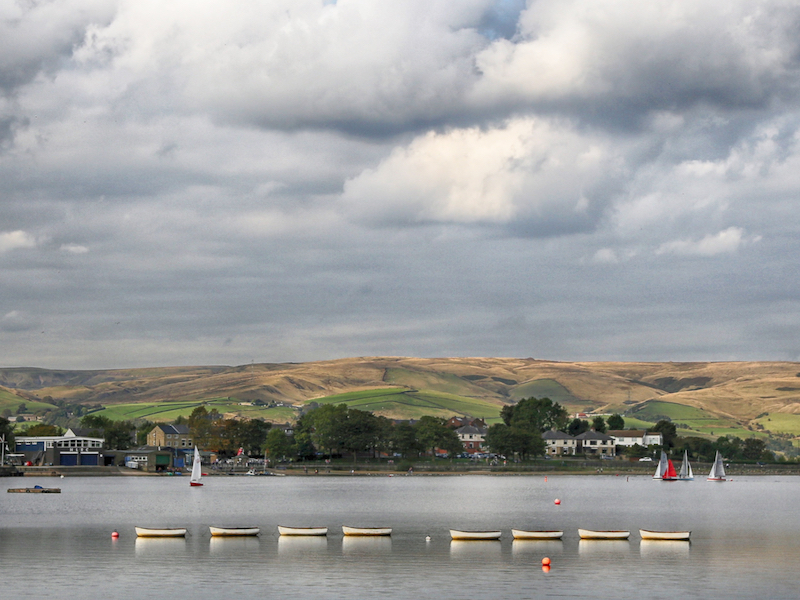 Steve Redgrave said that the lake was ‘“The bleakest place I have ever rowed.” Hollingworth Lake Sailing Club was founded in 1946. Stuart Bithell, Silver medal winner in the 470 Men’s sailing event at the London 2012 Olympics is a lifelong member of the Club, which has also trained a number of National and World Champions in other sailing classes in recent years. 2. At the Cafe the path bends left following the lake shore. 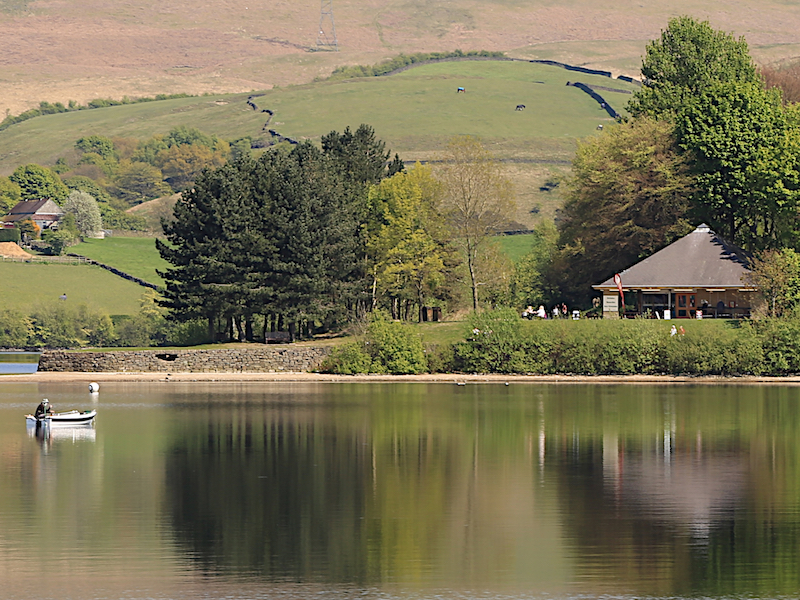 Follow the path around the lake, past a water sports centre, across another dam. Continue as the path bends to the right then left, to the head of a narrow inlet called Queens Bay, with a large house on higher ground above. 3. Turn left up a narrow, cobbled path with walls on both sides. 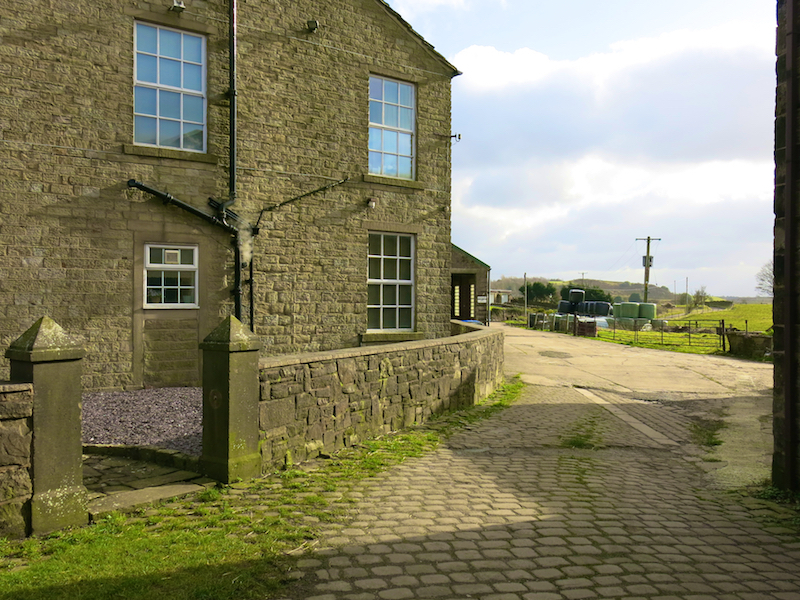 At the top of the cobbled path turn left through a farmyard then follow the track as it bends left then right up to the crest of a small rise then downhill. 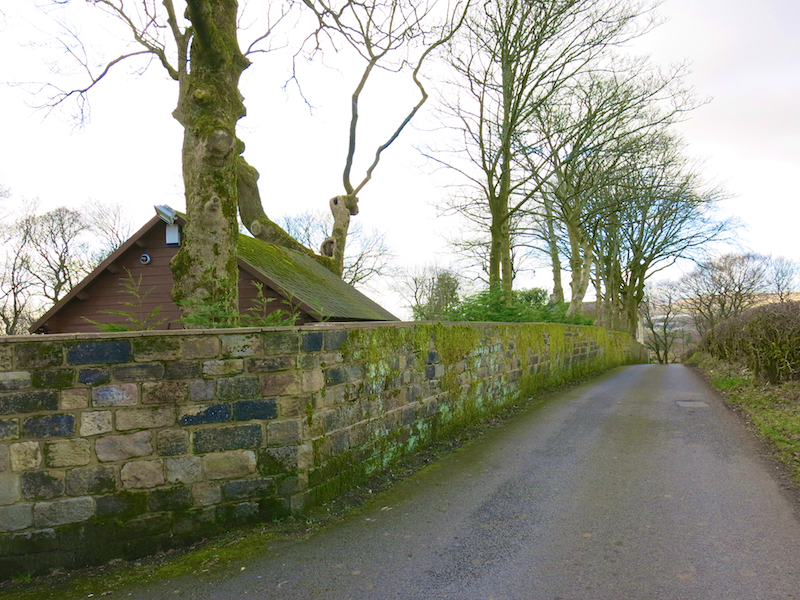 Pass a stone wall (at right angles to the road) on the right opposite a farm entrance. 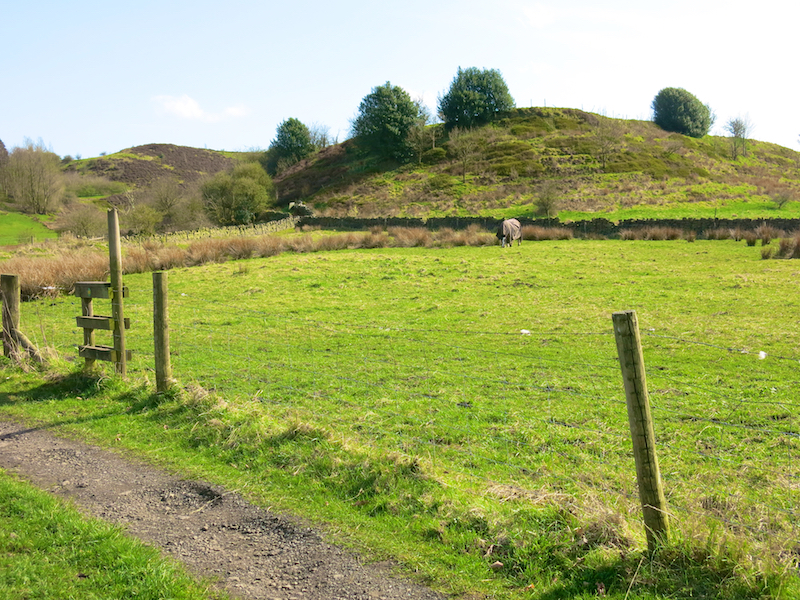 Do not cross the first stile by the wall but walk along to a second stile 100 metres further on the right. Cross the stile. 4. 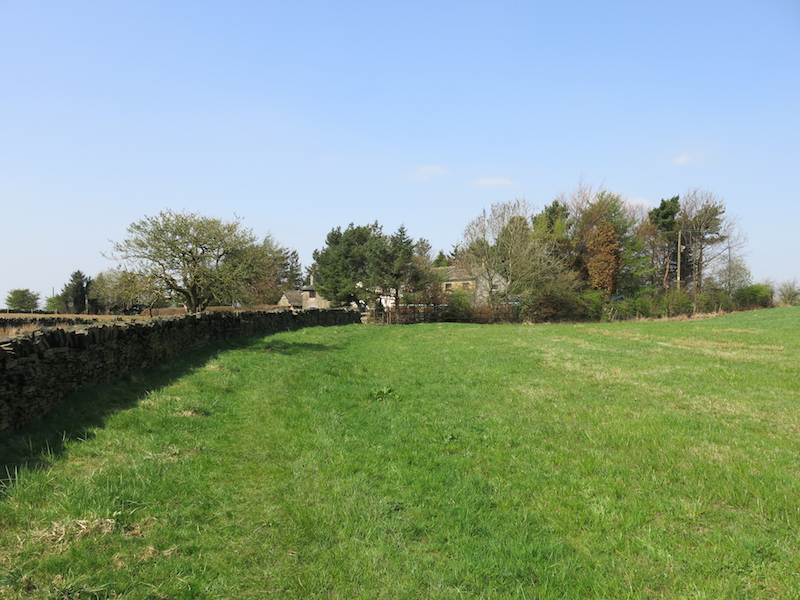 Cross the field diagonally at about 45 degrees to the right, heading for a gap in a stone wall with a stile. 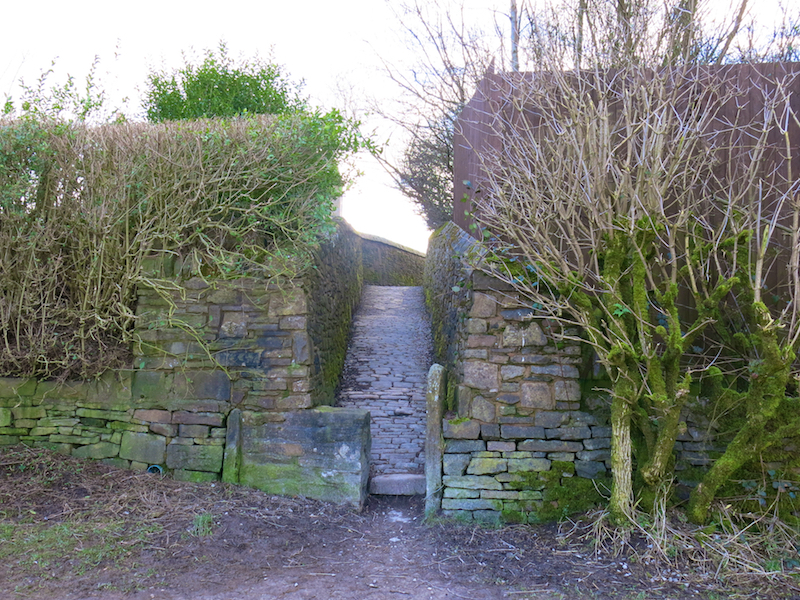 Pass through the gap (the stile is unnecessary) and then immediately go right up a slight incline with a wall on the right. 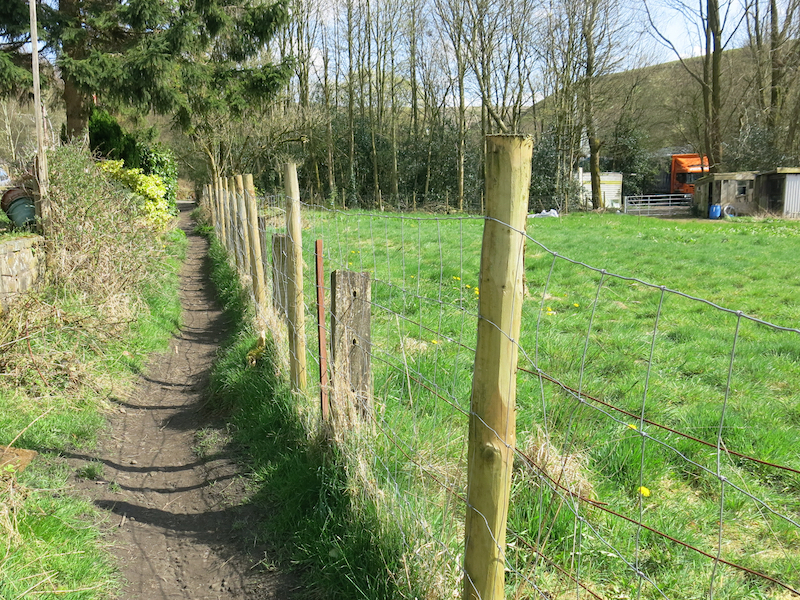 After about 20 metres, just past a gate on the right, turn left to follow a grassy path across the left side of a field. 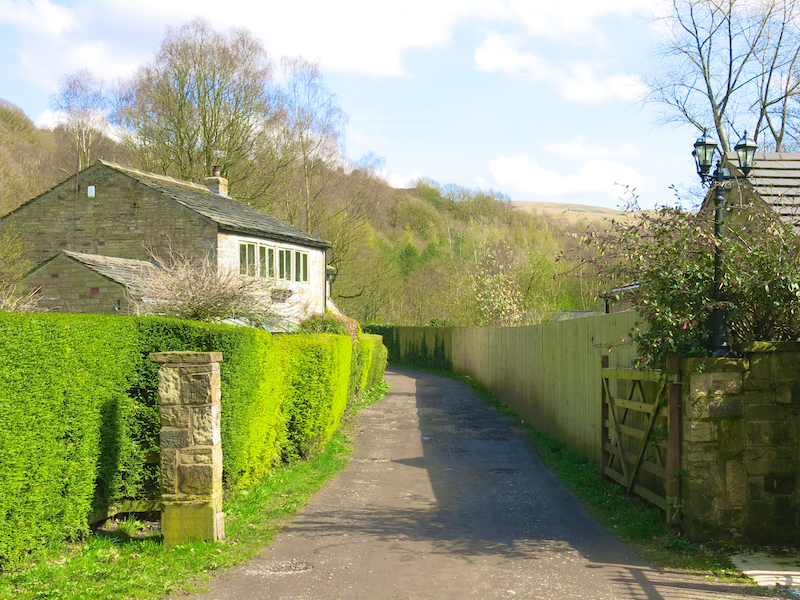 The path bends slightly right and heads for a small row of cottages. 5. 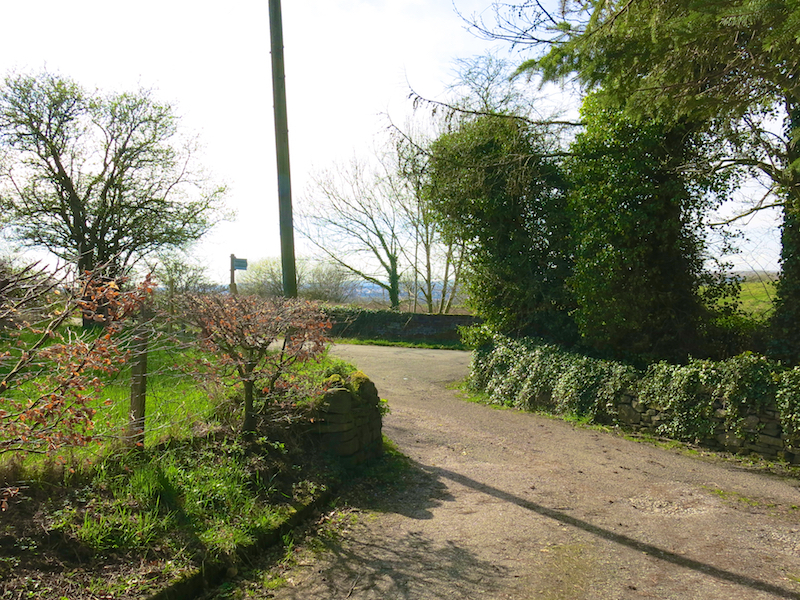 Just before the cottages, go left through a small gate onto a track. 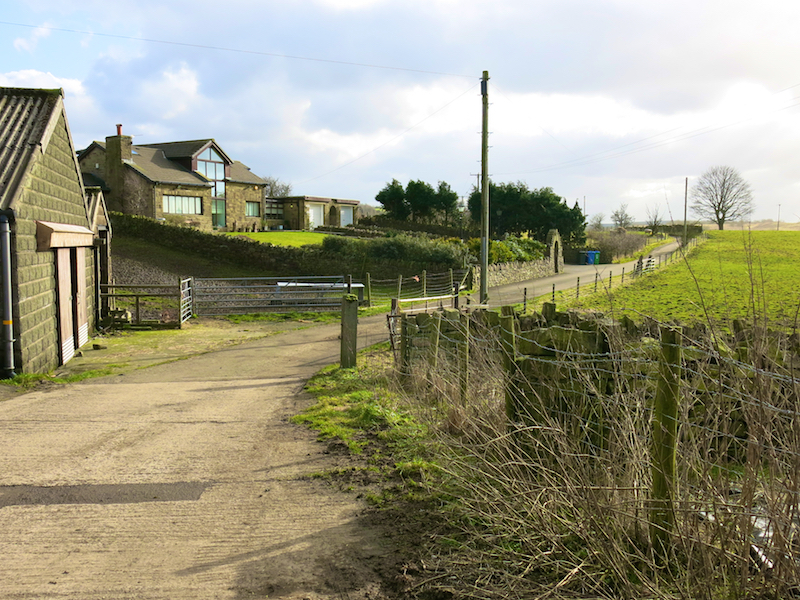 Pass the cottages, turn right at the end of the track onto a lane. 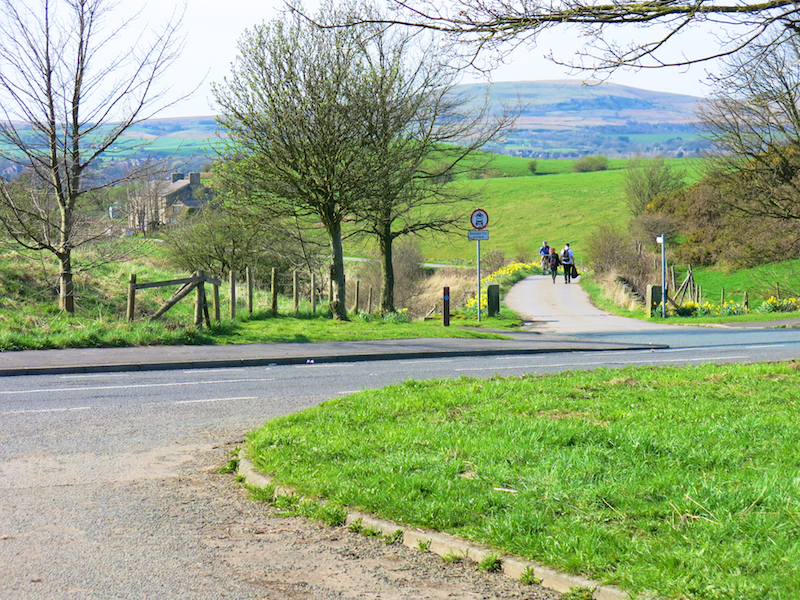 Cross the busy main road and follow another lane, almost opposite, past a farmhouse and more cottages on the right with views across fields towards Rochdale on the left. 6. 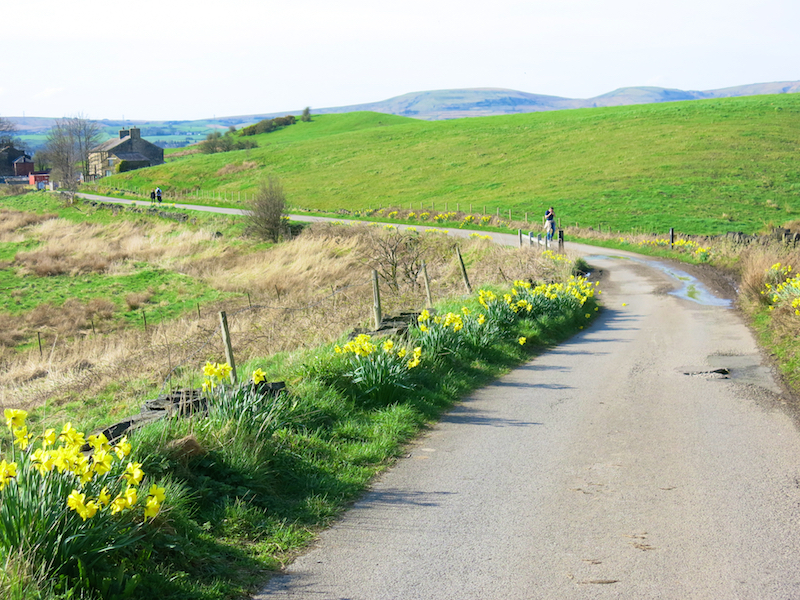 After passing a small lake on the left followed by a mossy stone wall, at a T-junction turn left. 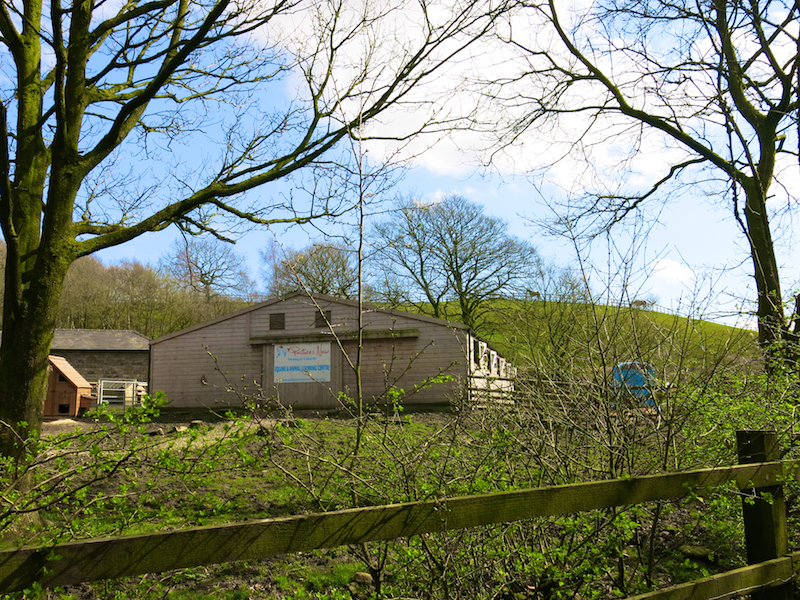 Walk between the former mill buildings, past Clegg Hall and Clegg Hall Cottages on the left and turn right where the track bends around a converted canal side barn. 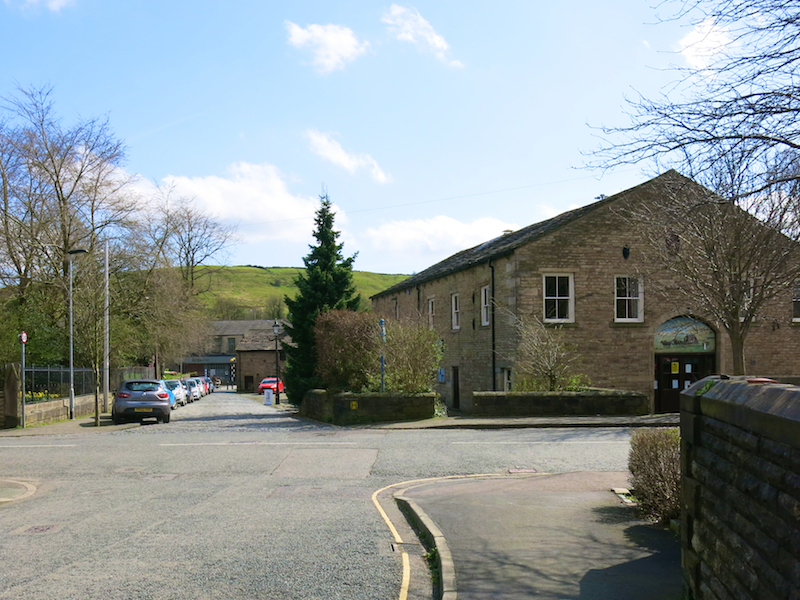 Clegg Hall is a 17th-century hall situated just outside Smithy Bridge. The “Clegg” in the name of the hall refers to the location (Little Clegg or Great Clegg) rather than the local family by the same surname. The house was built by a Theophilus Ashton in the early 17th century. 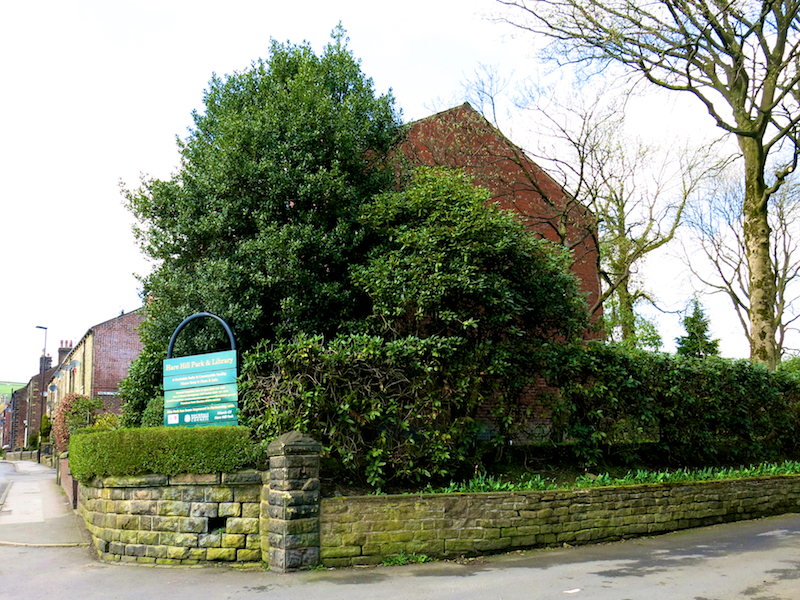 It appears to be on the site of an earlier Clegg Hall(s) whose occupants were Cleggs. The first known Cleggs, Bernulf (and his wife Quernilda) de Clegg were in the Domesday Book, though they are more commonly said to date to King Stephen’s reign (1135–1154). 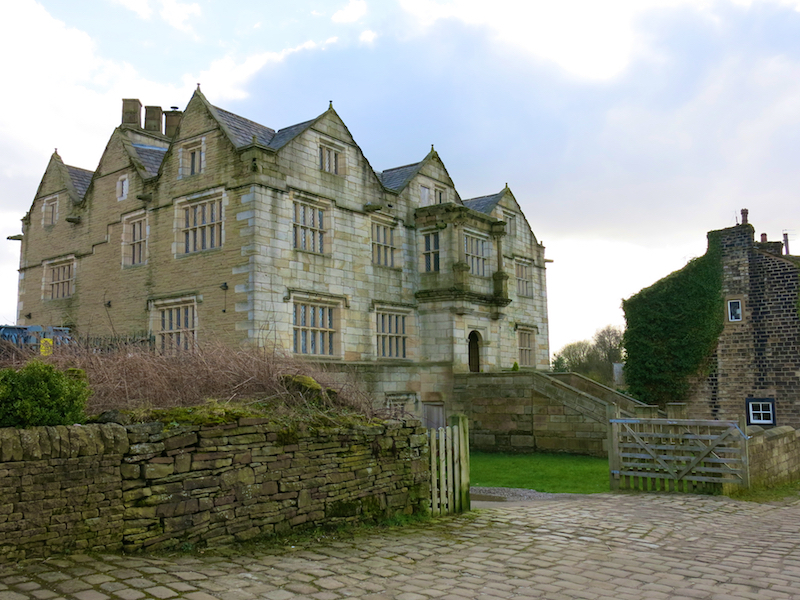 Clegg Hall is reputed to be haunted. The Clegg Hall boggart (as the ghost is better known) is usually placed in the 13th century. It is said that the master of the house went off to France to fight with Henry. While the father was away, the wicked uncle killed both his nephews, throwing them over the battlements into the moat of what was presumably a fortified house. Eventually the father returned. His brother crept through a secret passage from a nearby hall, ready to do away with the distraught father, when one of the children’s voices was heard calling out “Father beware!” (or words to that effect) and the father awoke, sending his evil brother running terrified to plunge to his death. Ever since, allegedly, the phantom boy has been heard issuing warnings. At least two books refer to the ghost and later uses of the current building. 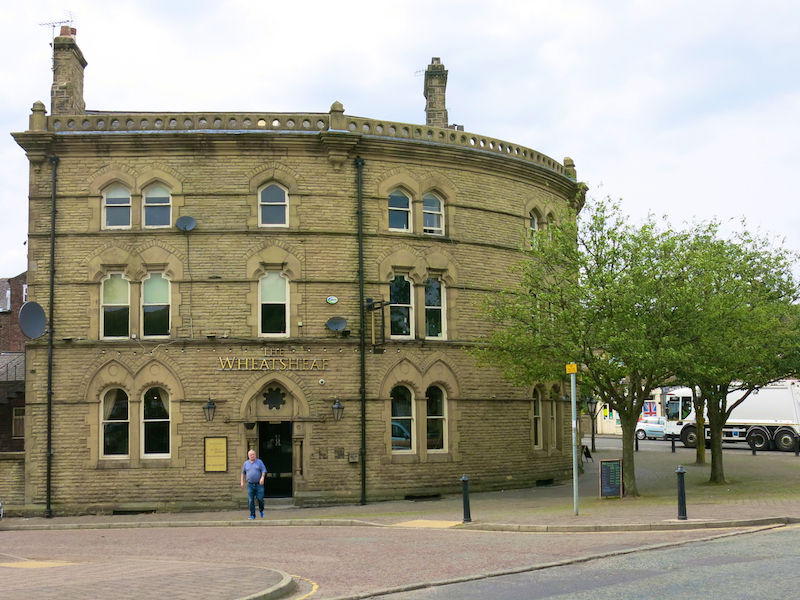 One is Harland and Wilkinson’s Lancashire Legends, originally published in 1873. 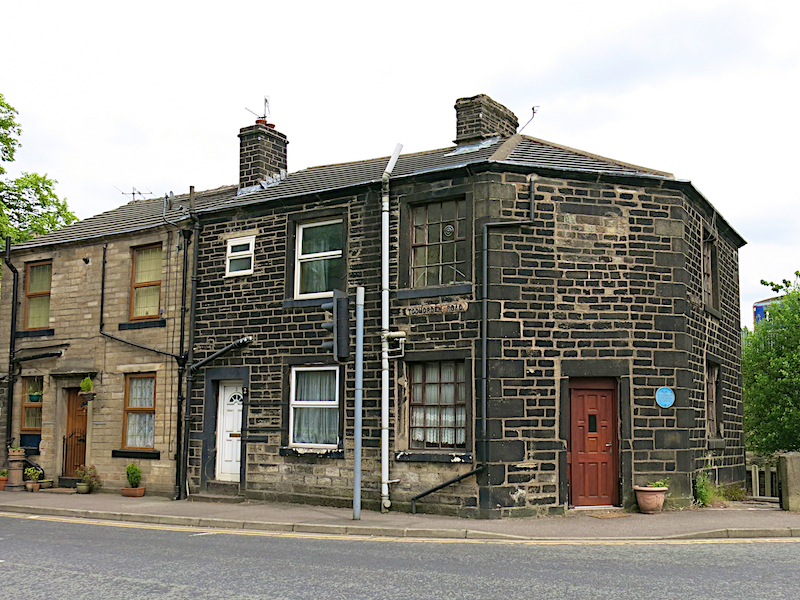 This says: “After many changes of occupants it is now in part used as a country alehouse; other portions of it are inhabited by the labouring classes, who find employment in that populous manufacturing district.” The other, Lancashire Legends by Katherine Eyre (1972), says that from 1818 to 1869 it was a public house called the Horse and Hounds, but generally known as the Black Sloven, the name of a favourite hunting mare of legendary speed which belonged to the former owner, Mr Charles Turner. It says that “The Boggart Chamber” became a place to be avoided, although it is not clear if this was in the pre-1620s house or not. It also says that “during the Commonwealth era, there were hints of counterfeiting activities in the vaults and cellars of Clegg Hall”; it was common for smugglers and counterfeiters of the period to use tales of ghosts to scare off locals. 7. 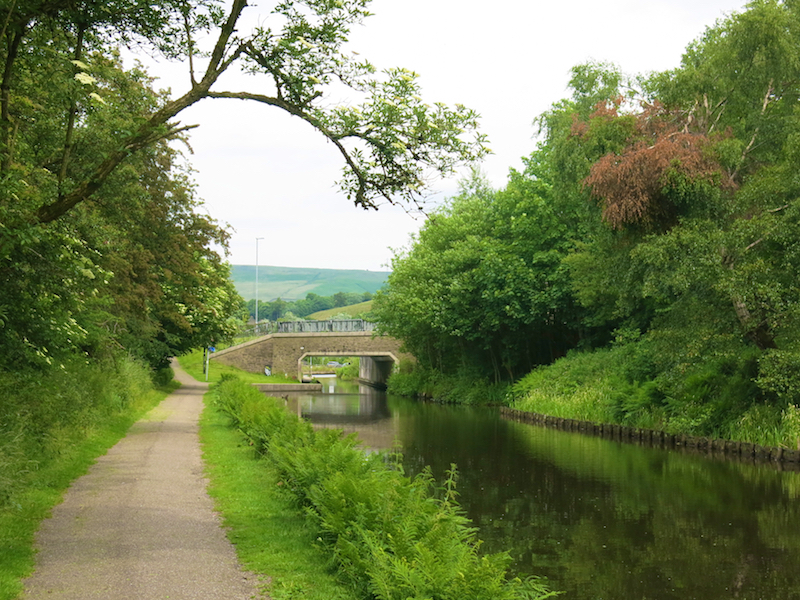 Cross the canal bridge then turn right down a path to join the Rochdale Canal towpath. 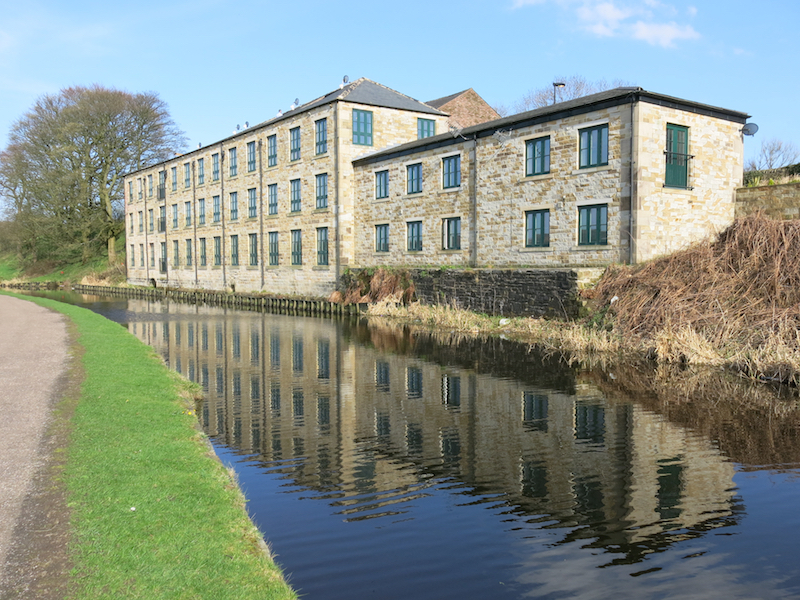 Continue along the towpath towards Littleborough, passing Clegg Hall and the mill buildings again, this time on the other side of the Canal on the right. 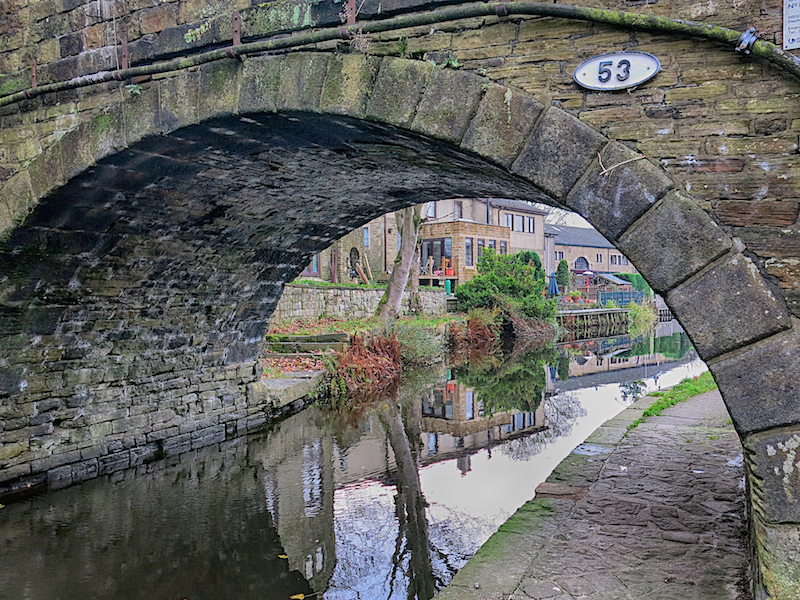 The Rochdale Canal is a navigable broad canal between Manchester and Sowerby Bridge. 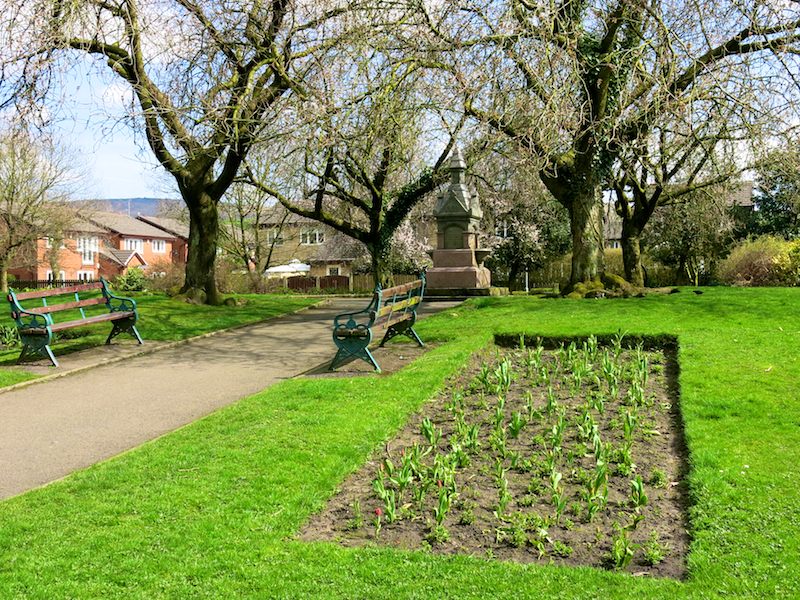 Its name refers to the town of Rochdale, through which it passes. 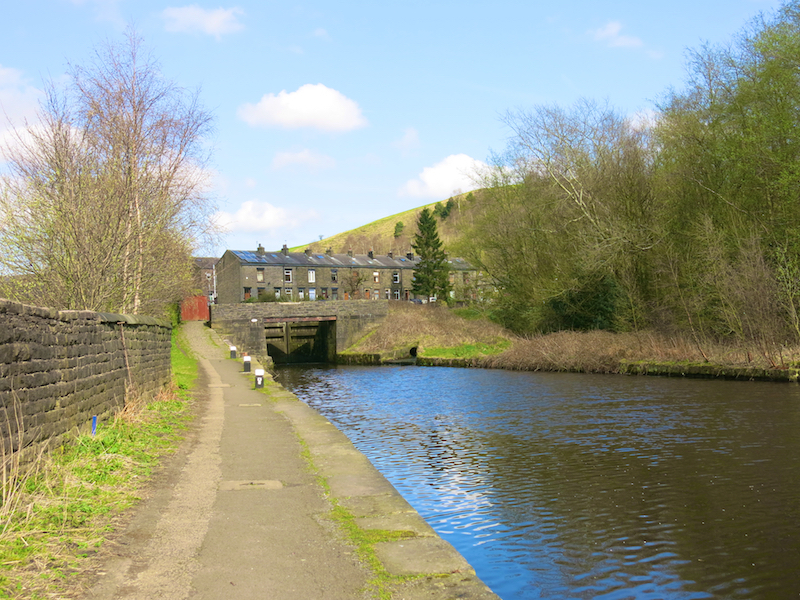 The Rochdale is a broad canal because its locks are wide enough to allow vessels of 14 feet width. 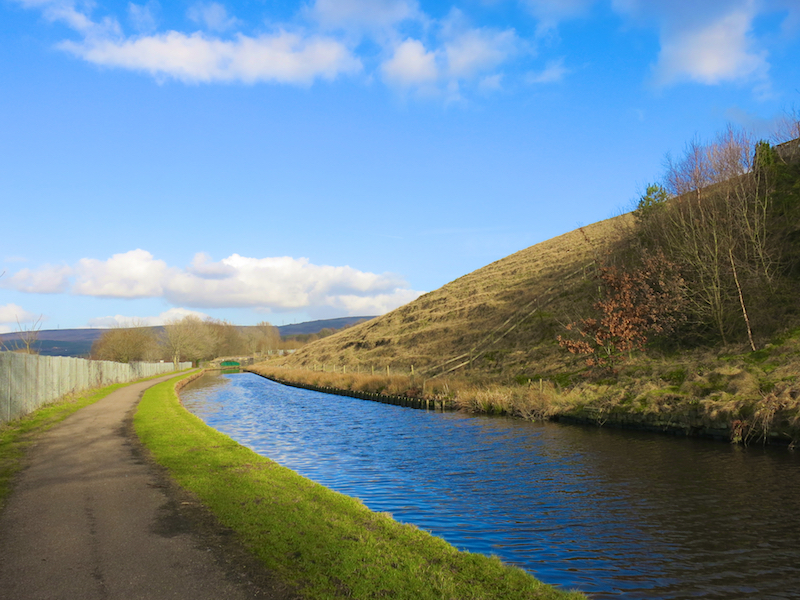 The canal runs for 32 miles (51 km) across the Pennines. 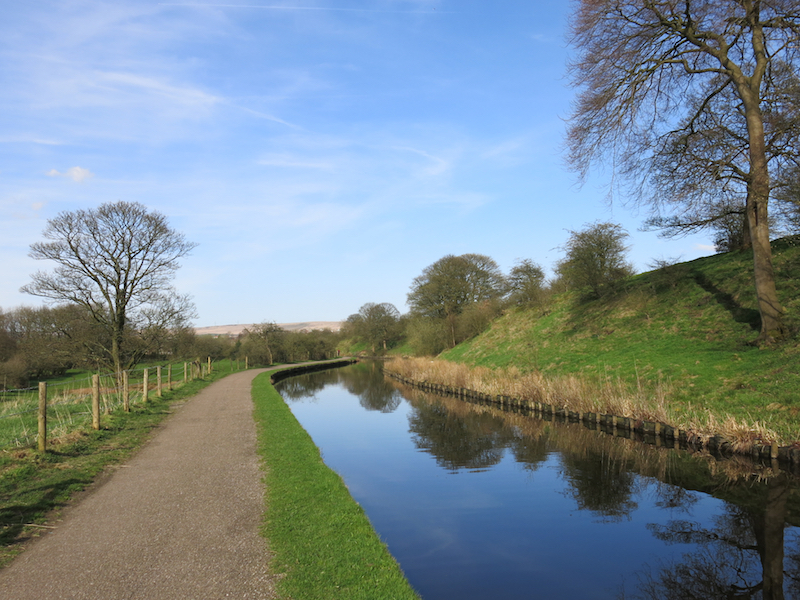 It was the first canal to cross the Pennines between Lancashire and Yorkshire. 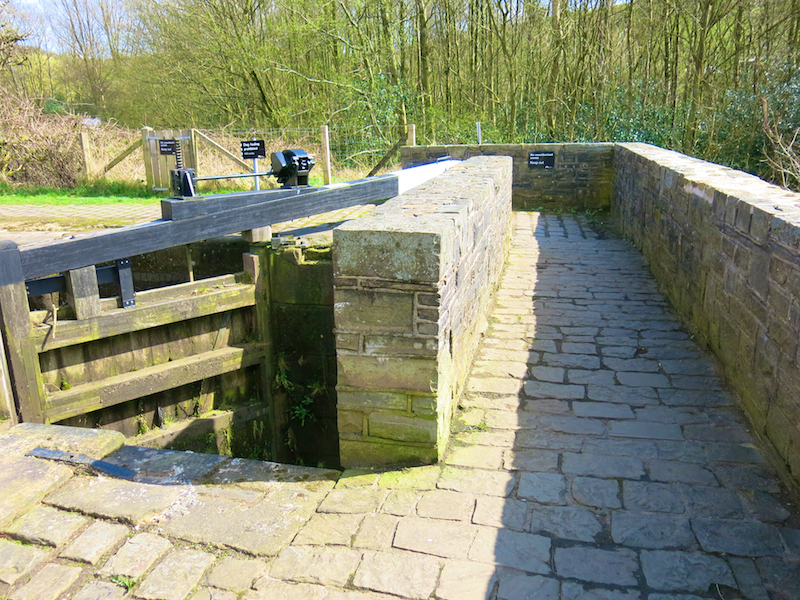 Because of its width, the canal was more successful than the Huddersfield Narrow Canal and became the main highway of commerce between Lancashire and Yorkshire. 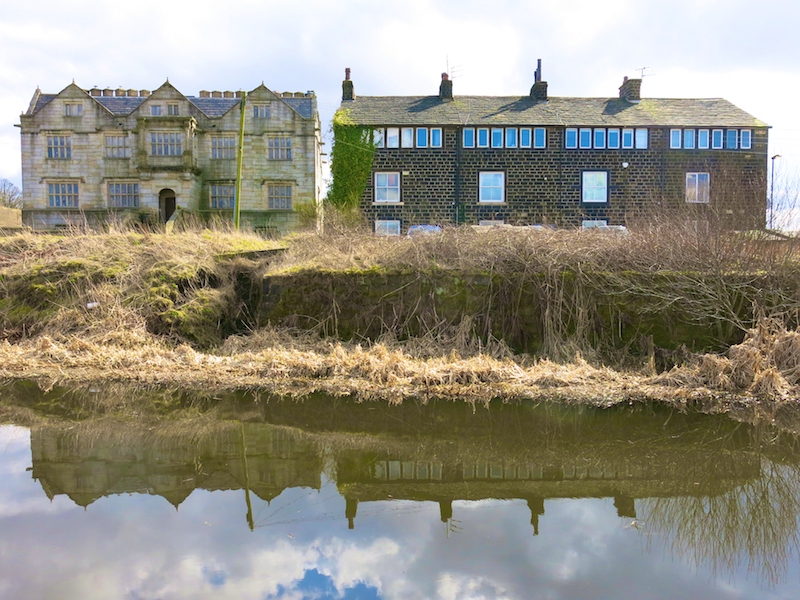 Amongst the plants growing in or near the canal are rare examples of floating water plantain. 8. 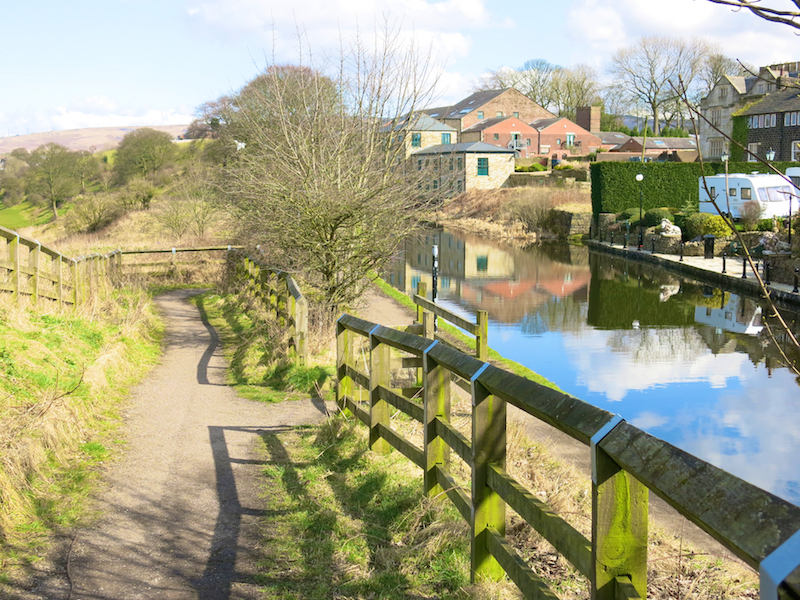 Stay on the towpath for about 1.5 miles, passing on the way Smithy Bridge railway station to the left, near bridge 54. 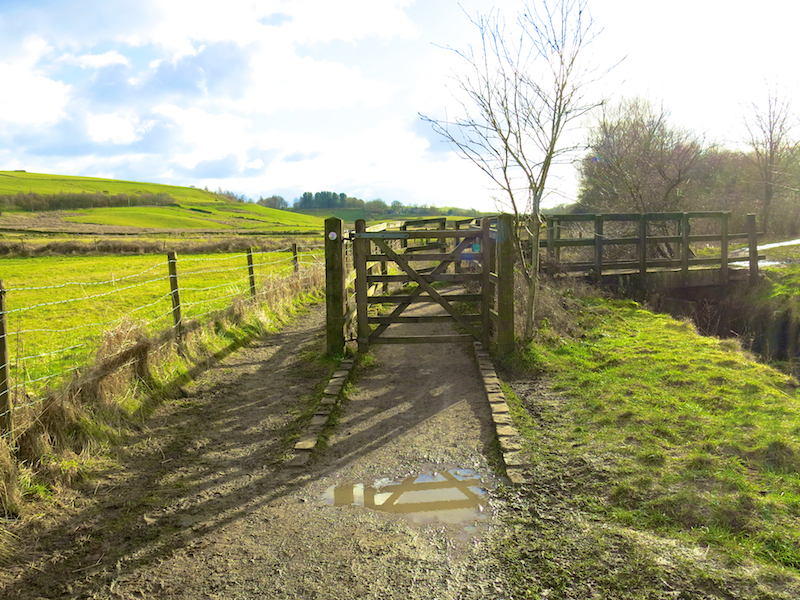 After going through bridge 51 the towpath rises to the roadside. 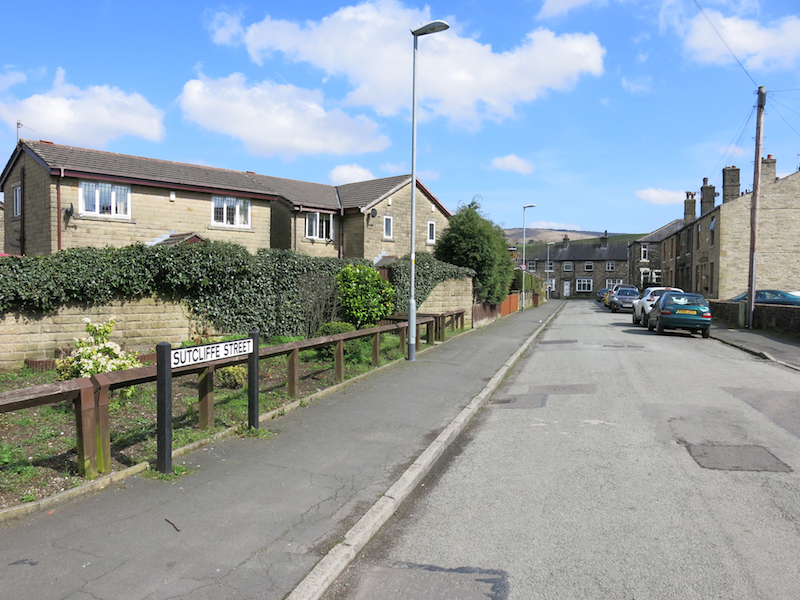 Cross the road and walk along the road to Littleborough Railway Station. 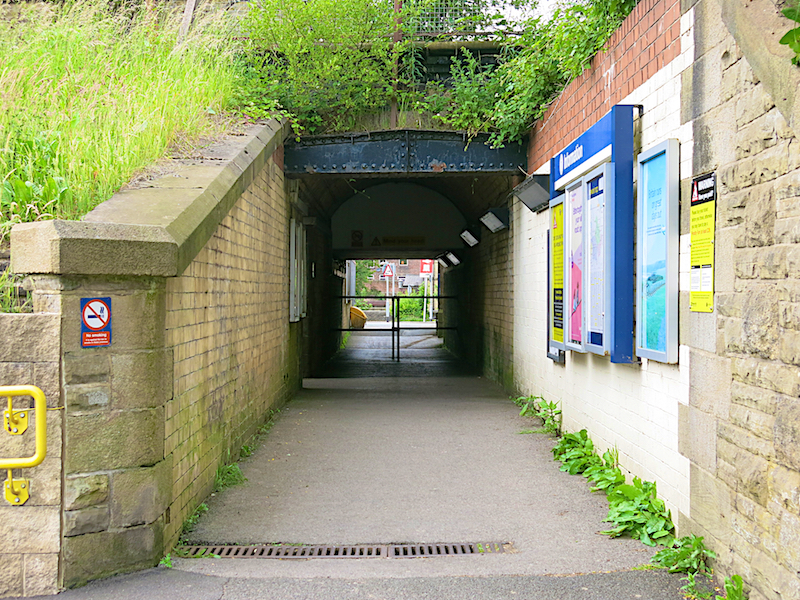 Turn left and walk through the underpass, beneath the railway. 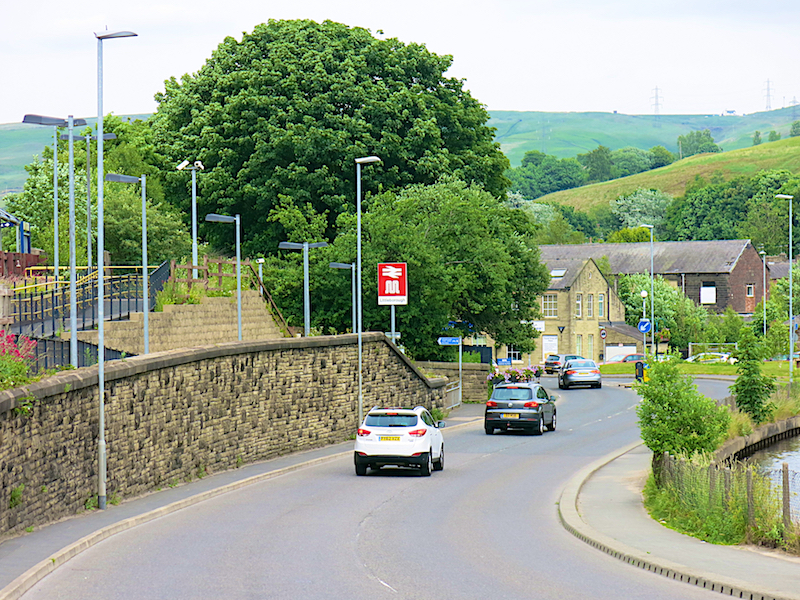 Smithy Bridge station was first opened in October 1868. In 1915, the station was the scene of a tragic accident involving an express train and an empty stock train. Four people died and many others were injured. It was closed on 2 May 1960 but reopened on 19 August 1985. 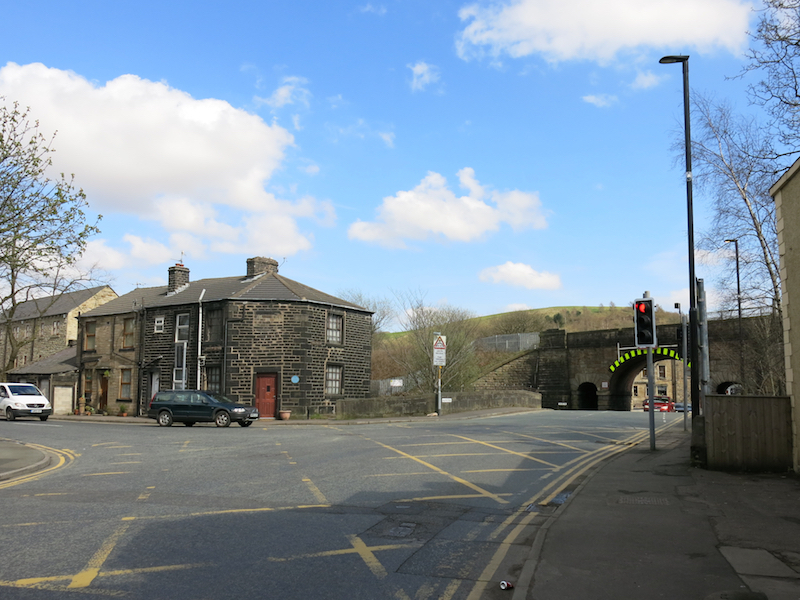 Littleborough Railway Station sits above the town on a multi-arched viaduct. 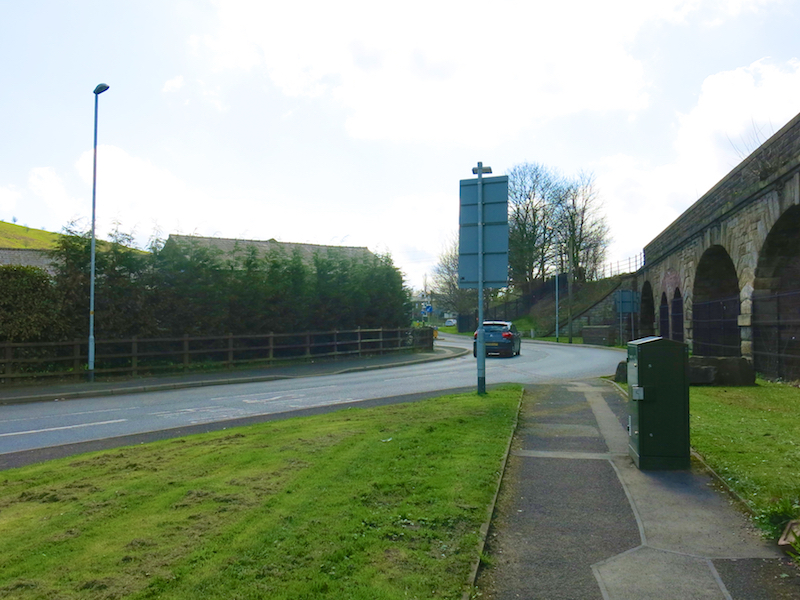 Designed by George Stephenson and completed in 1839, this historically significant viaduct is Grade II listed. 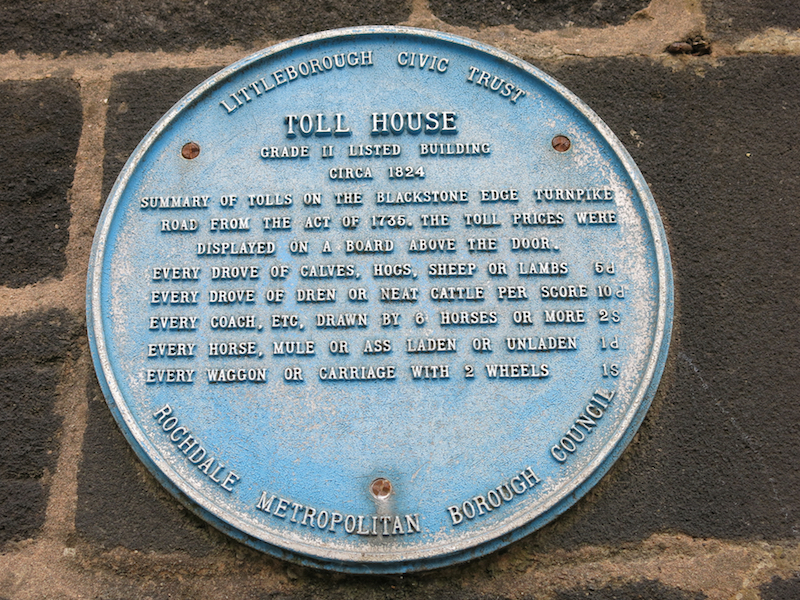 Just over a mile to the north of Littleborough Station is the Summit Tunnel, one of the oldest railway tunnels in the world, built between 1838 and 1841. The tunnel is just over 1.6 miles (2.6 km) long and carries two tracks. 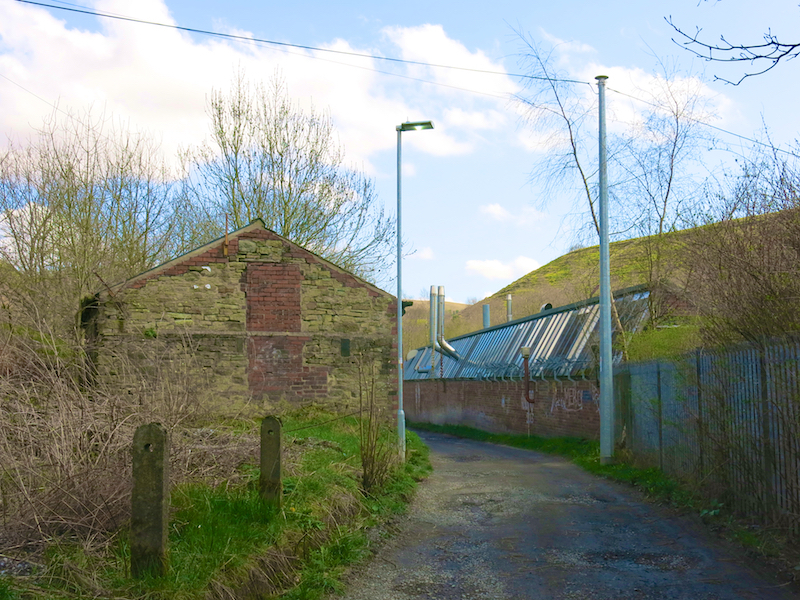 The tunnel was mined by hand through shale, coal and sandstone, then lined with six courses of over 23 million bricks. When completed in 1841, it was the longest railway tunnel in the world. 9. 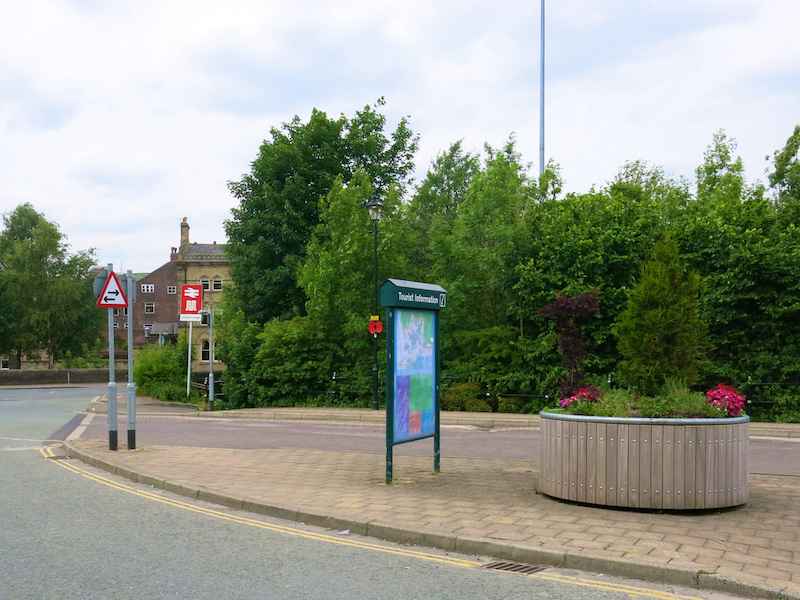 On the far side, cross the bus turning area, with a Co-op supermarket on the left. 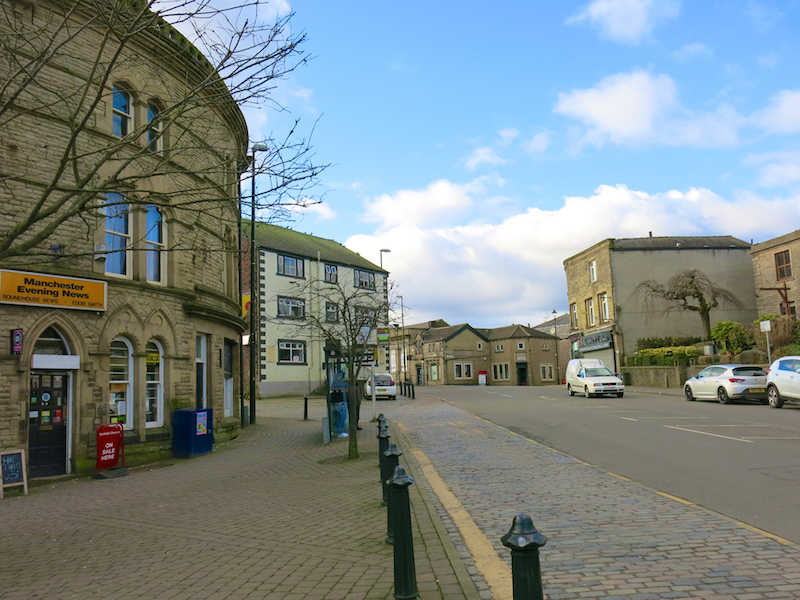 Cross the road and head right towards the Wheatsheaf pub. Go to the right of the pub and turn left. 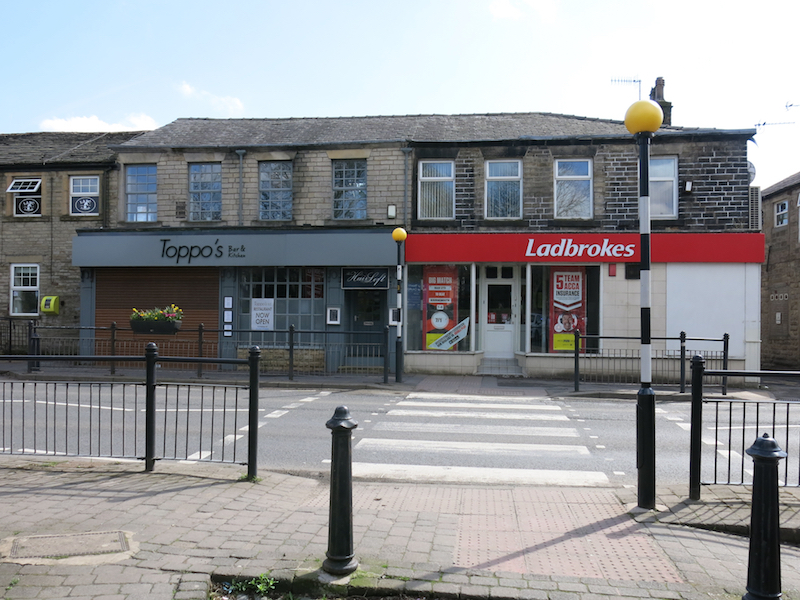 Cross the road towards the “Chippy” then turn right up Hare Hill Road, Littleborough’s main shopping street. 10. 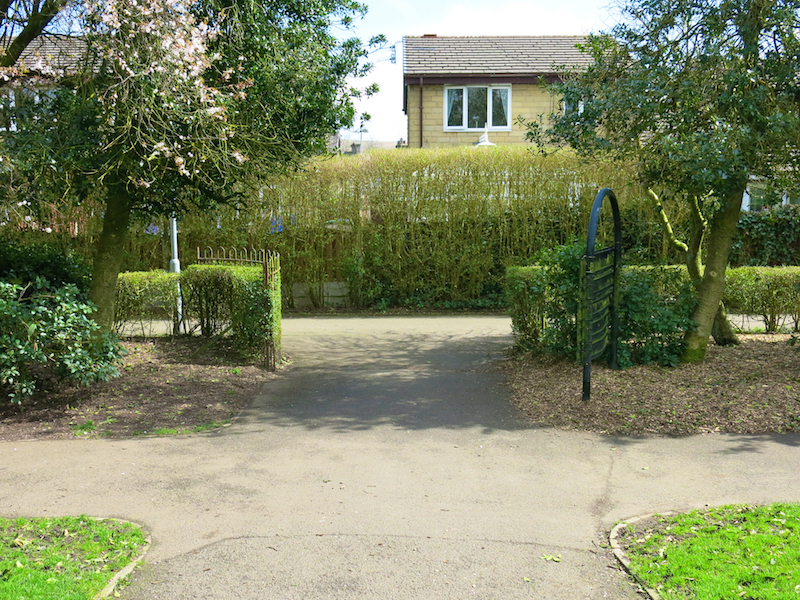 Continue along Hare Hill Road until the entrance to Hare Hill Park, with a green sign by a low wall. Turn right into the park. 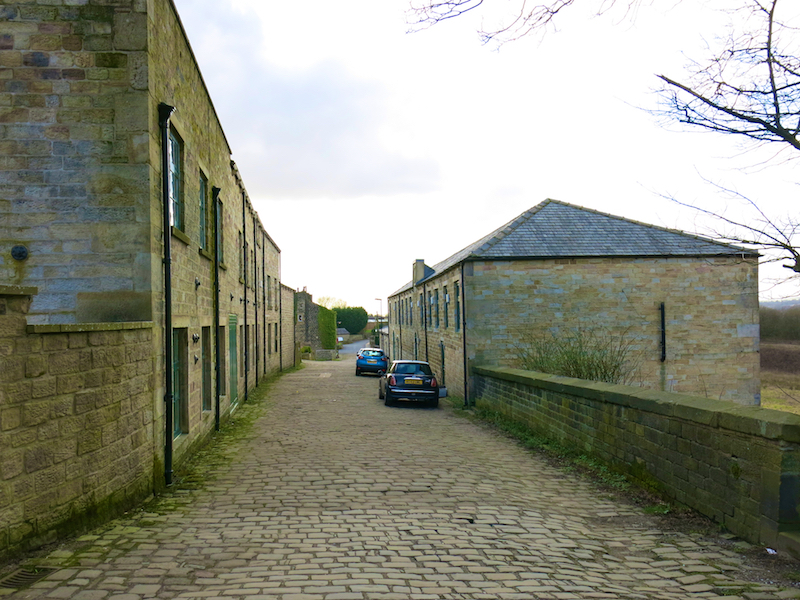 After 20 metres turn right again up a narrower path, passing a play area on the right and walk towards the front of the large stone building – Hare Hill House, ahead. 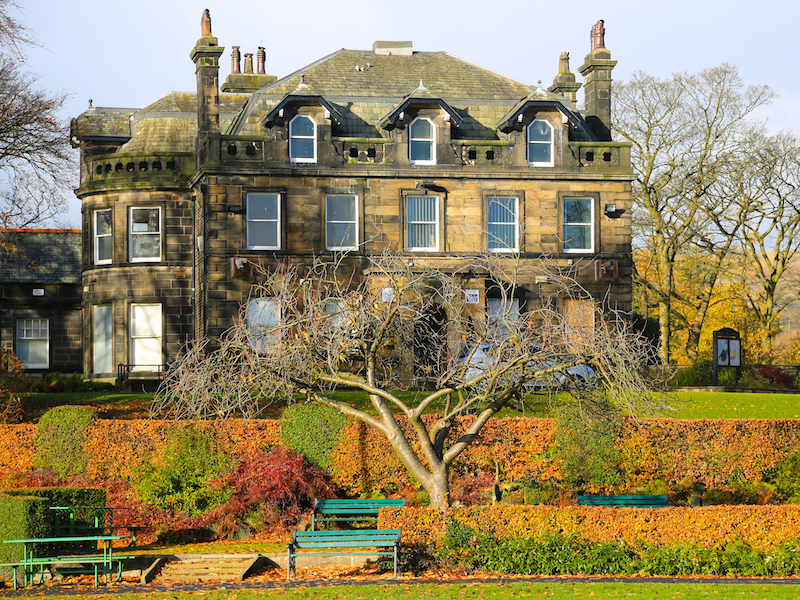 Hare Hill House was built in 1837 as the residence of the Newall family who played a significant role in the 19th Century development of Littleborough. Sybil “Queenie” Fenton Newall was born in Hare Hill House, on 17 October 1854. She was an archer who won the gold medal at the 1908 Summer Olympics in London. She was 53 years old at the time and is still the oldest female gold medal winner at the Olympic Games. Great Britain did not win another women’s archery medal at the Olympics until 2004. 11. 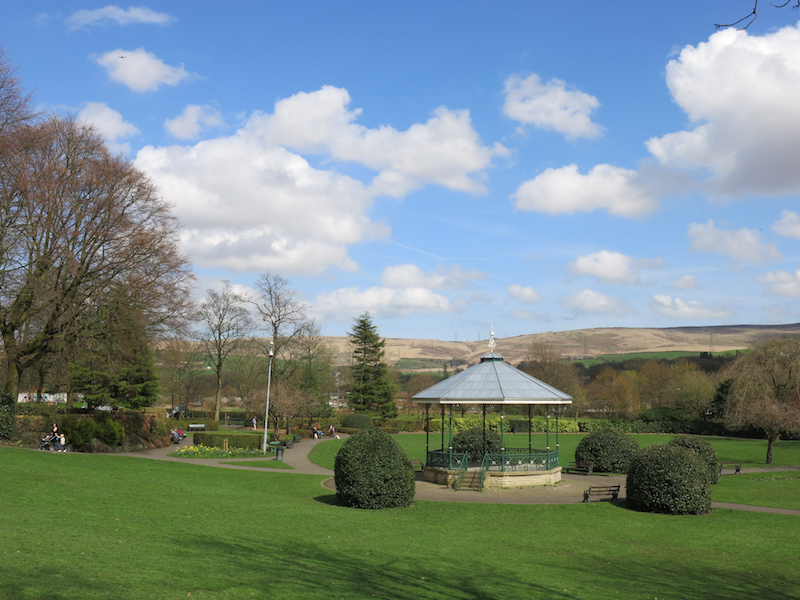 Leave Hare Hill House down the slope towards the bandstand and continue past the bandstand to the ornate water fountain. Continue past that to the park exit. Turn right out of the park and then left on Sutcliffe Street. 12. At a T-junction turn right into Townhouse Road then left into Lodge Street. 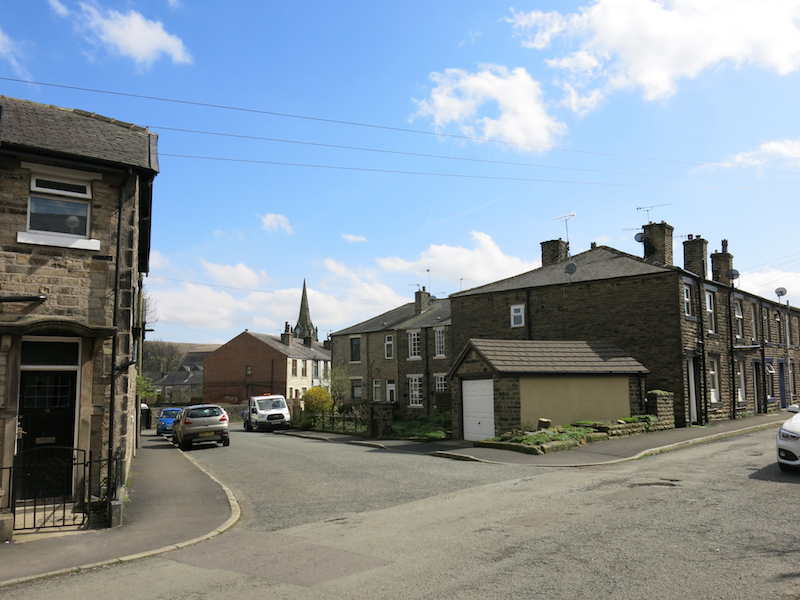 Follow Lodge Street as it bends right. 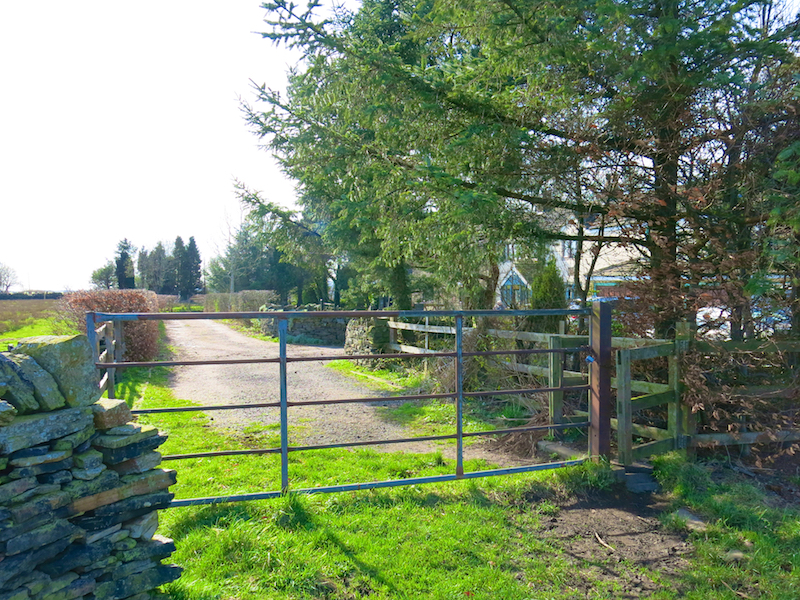 Continue straight on at a crossroads with the Coach House on the right and then Holy Trinity Church on the left. 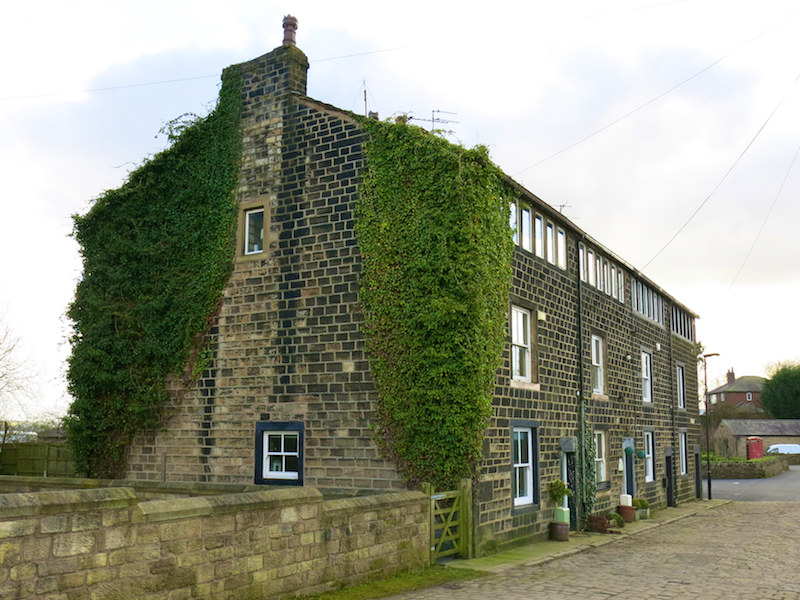 The Coach House is a grade 2 listed building within a conservation area. 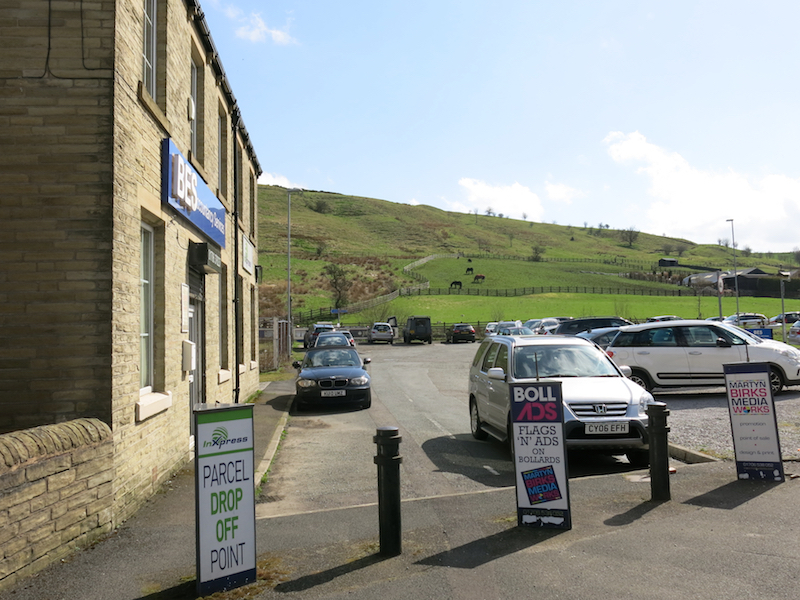 Dating from the late 18th century, it was originally built to serve the Bury horse-drawn coach traffic on the main transport routes into Yorkshire across Blackstone Edge. 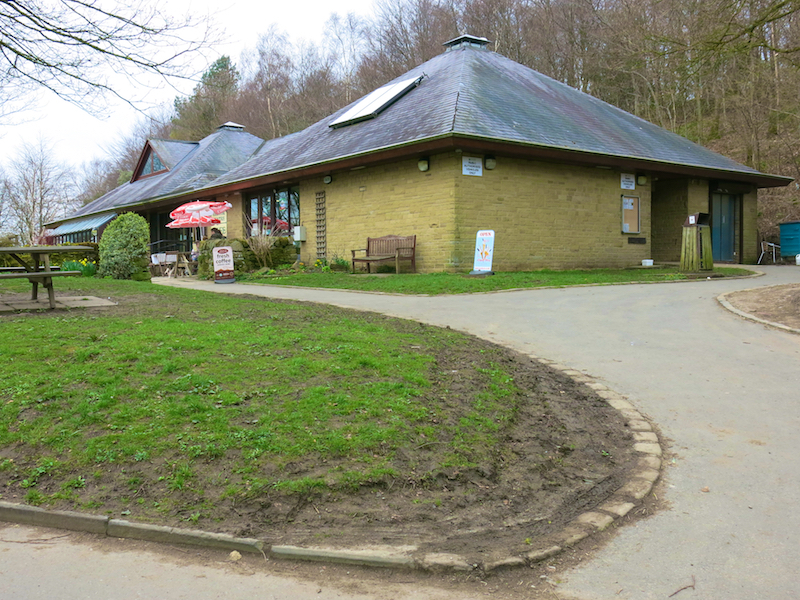 It is now run by a local heritage trust and contains a heritage centre and cafe. 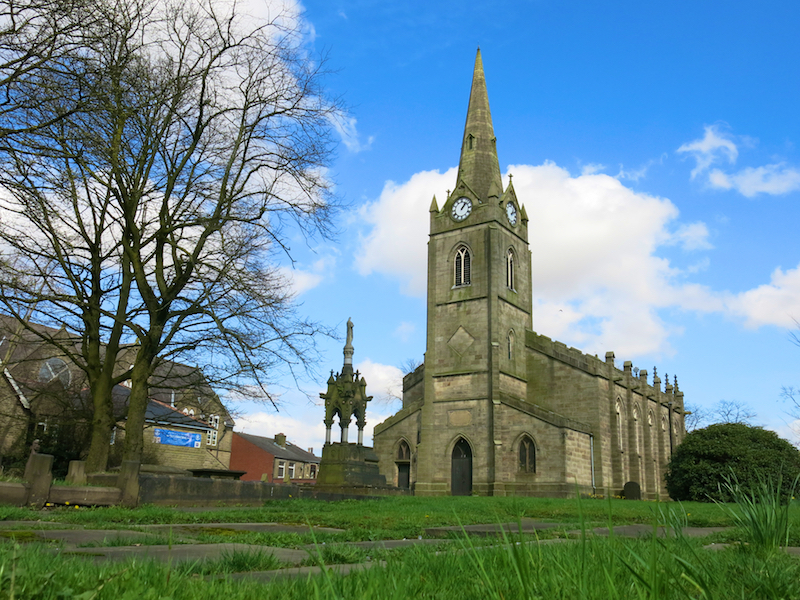 Holy Trinity Church was consecrated in 1820, having been built very close to the site of the Chapel that had served the community since 1471. By 1800 the Chapel was in a very poor condition and described as dangerous. Money to build the new church was raised by public subscription. 13. Cross Church Street by the pedestrian crossing and, by Toppo’s, turn left. 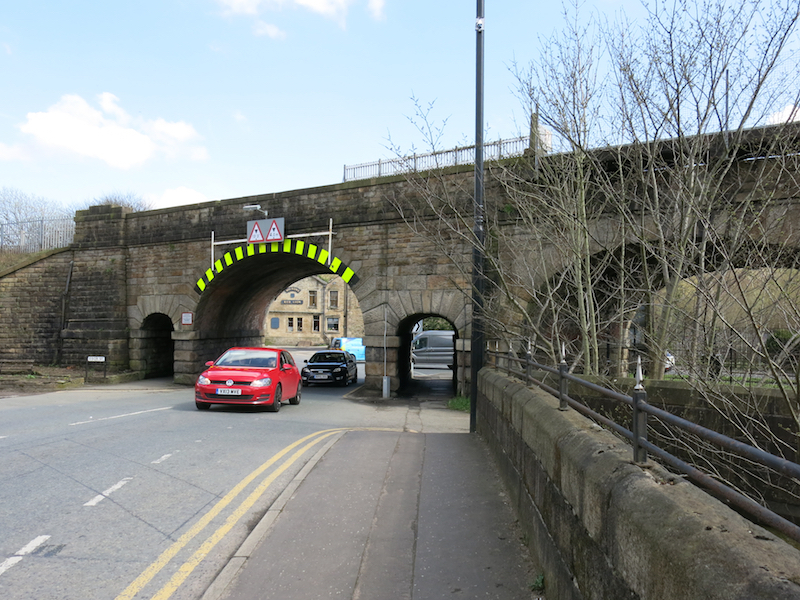 Carry straight on by the traffic lights and walk beneath the railway arches. Turn right into Canal Street. 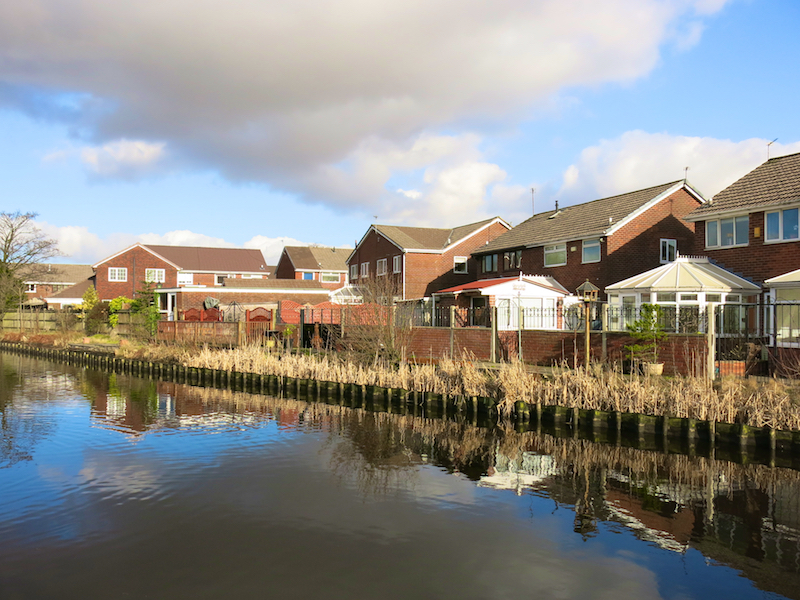 Cross Canal Street and walk around the bend to the left then turn left into a parking area by some offices and the canal ahead. 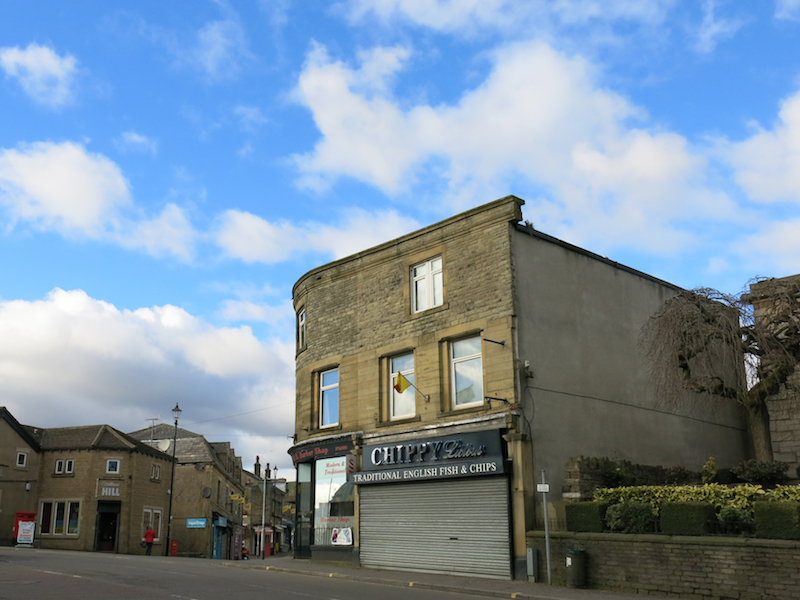 On the opposite side of the traffic light junction is an odd-shaped corner building, which was a former toll house for those using the Blackstone Edge Turnpike. 14. At the canal towpath turn left and walk up to bridge 50. 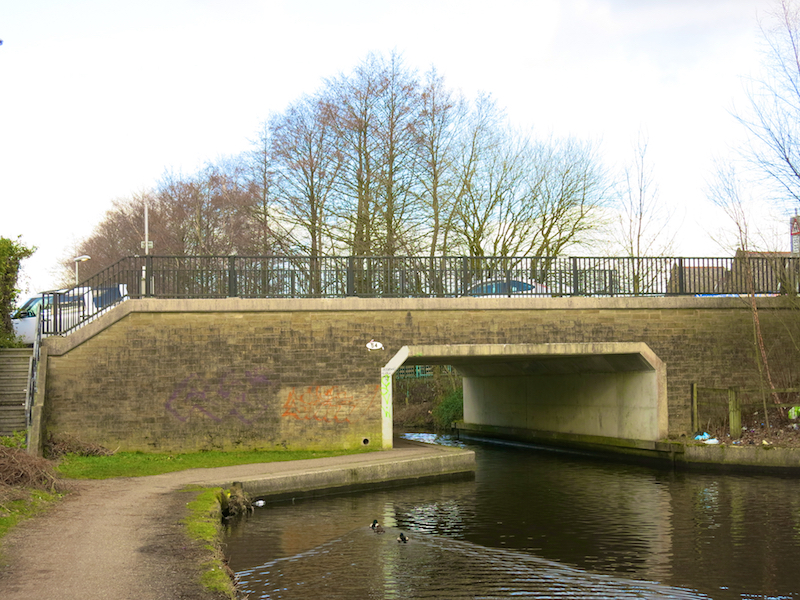 Cross the bridge by lock 48 then immediately turn left. Follow the cobbles, then a narrow, often muddy, path towards a terrace of houses. 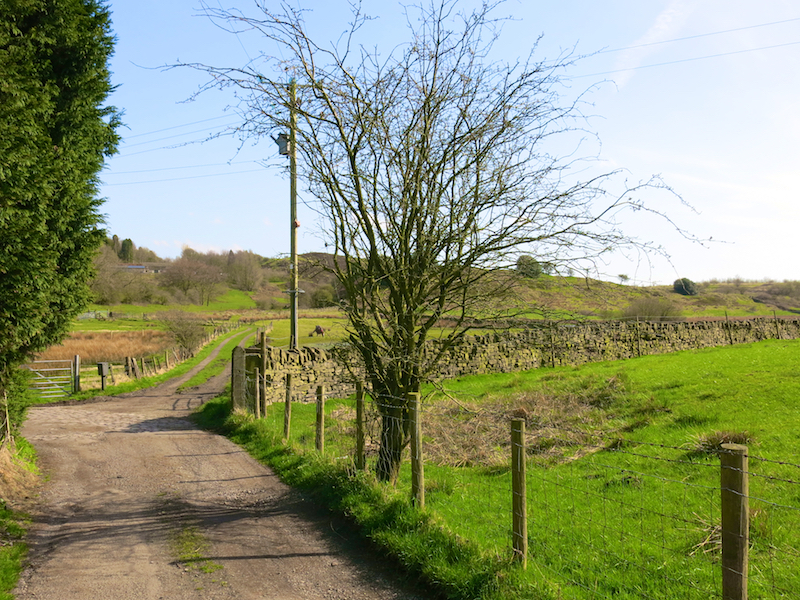 The path turns right in front of the houses and becomes very narrow. Follow the path, which widens beyond the houses. Where the path ends take the second track on the right. 15. 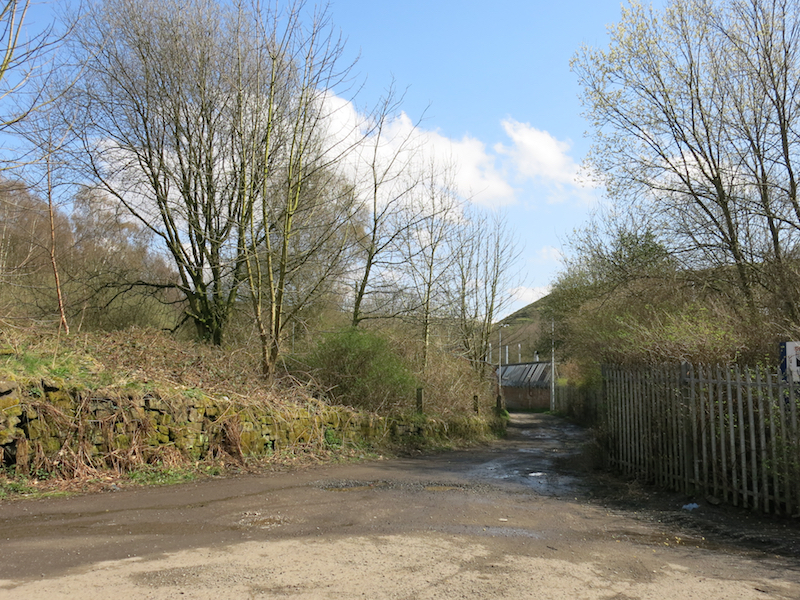 Follow this track as it passes a small factory on the right, a cottage on the left and some stables on the right. 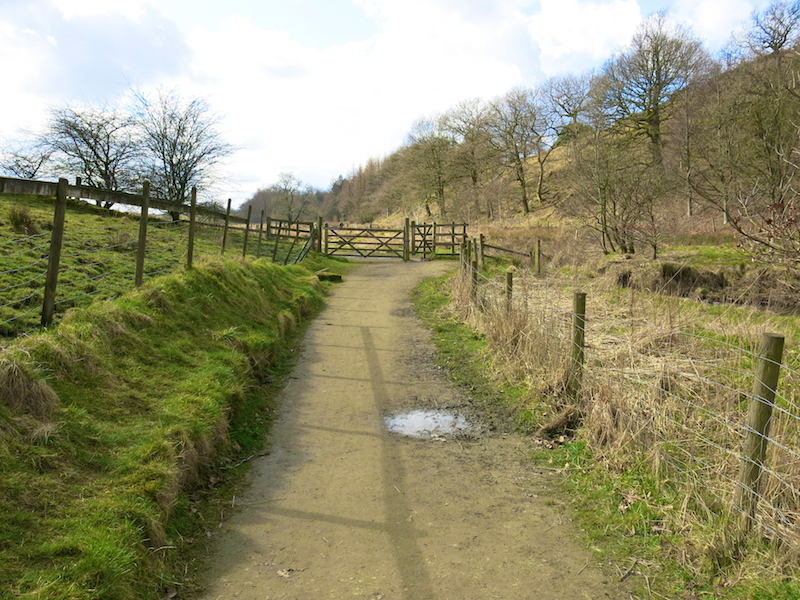 The path goes between rows of trees and follows a stream on the right with steep slopes on both sides. 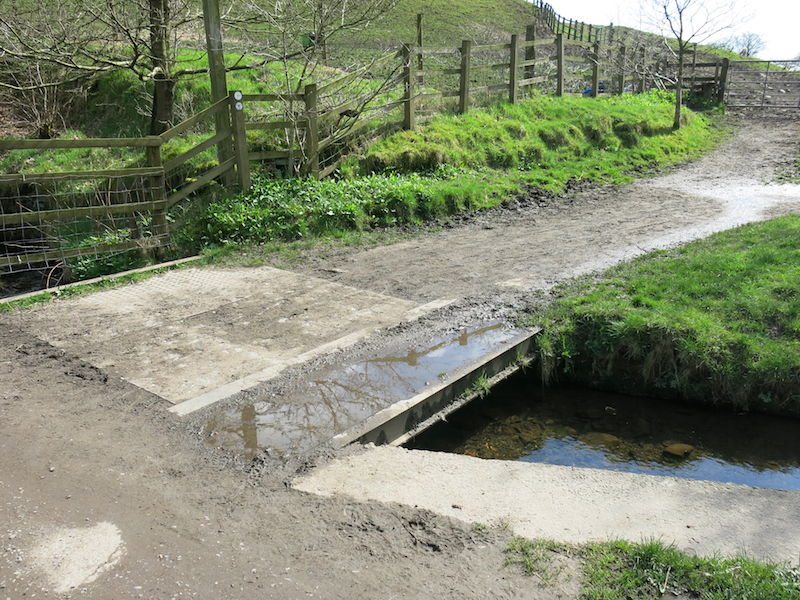 After passing an “Equine and Animal Learning Centre” on the left, cross the stream on the right via a bridge. 16. 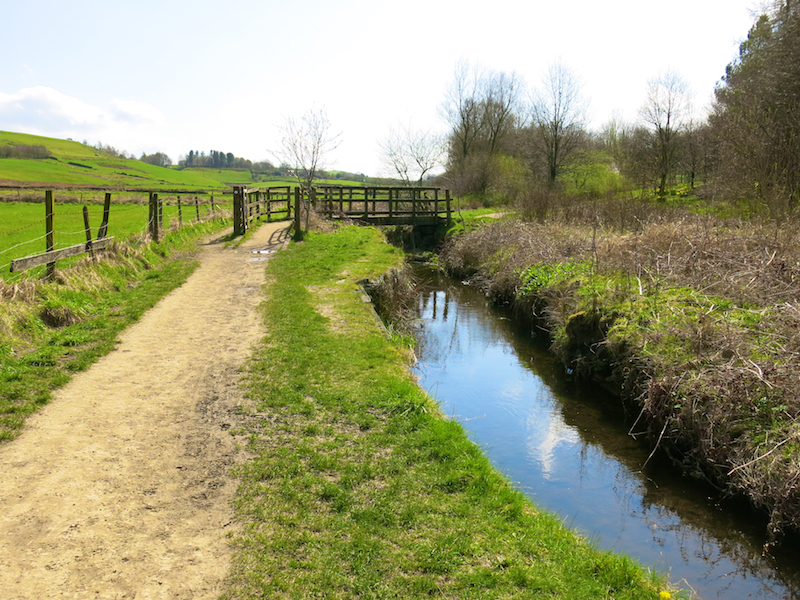 Follow the path, with the stream on the right and fields above it and on the left. Pass through four gates. After the fourth gate cross a bridge to the right and follow the path up a slight hill with a wood on the right. Bear right at a track. 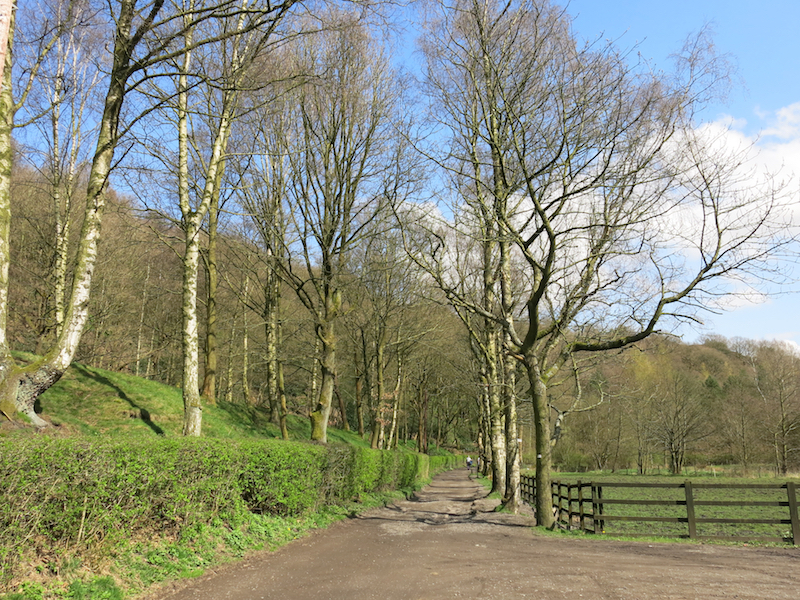 Follow the track, past car parking in the woods on the left to the Visitor Centre.